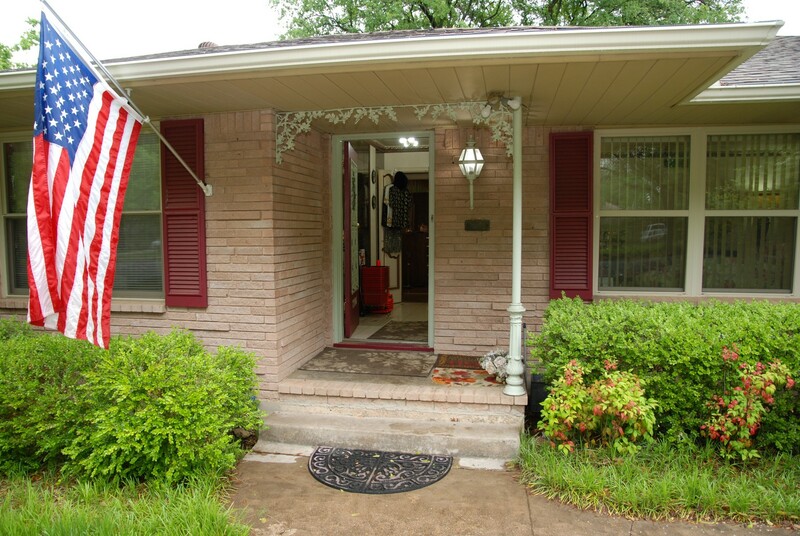 to our exclusive virtual pre-sale tours, pictures, and a map to the sale location. you are responsible, click on the "Free Consultation" link to contact Donna. 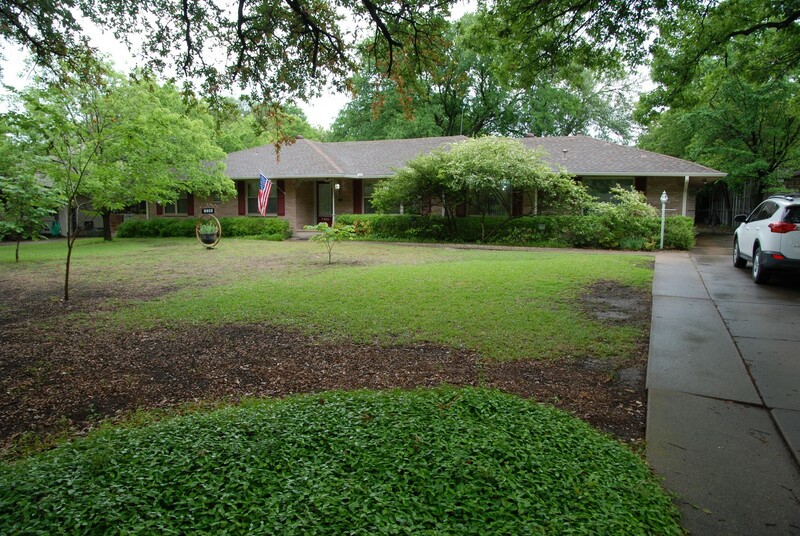 Call / Text Donna directly at (972) 679-3100, and Donna will get back to you as soon as she can. 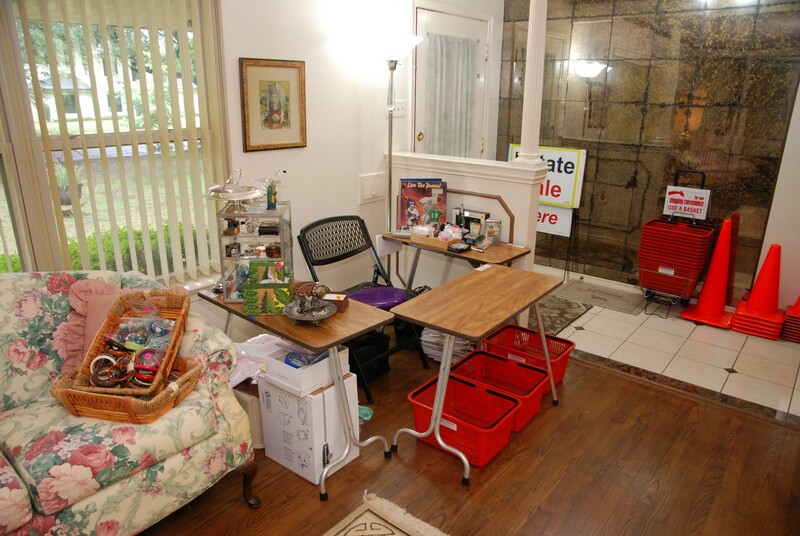 ClutterBlasters is a woman-owned and managed business dedicated to helping you with your estate sale, downsizing, or moving sale by de-cluttering and organizing so you can use more of your talents without being distracted by clutter or bothered by an overwhelming situation. 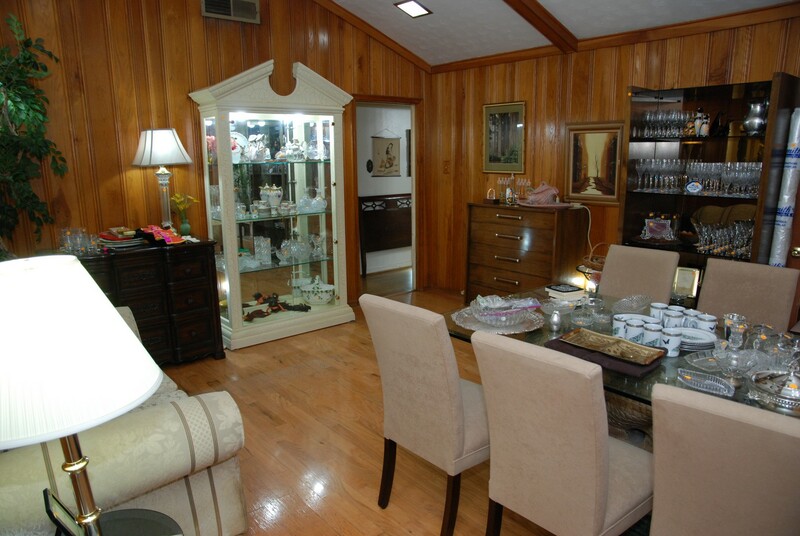 You can view feedback from some of our satisfied Estate Sale clients by clicking on this "Testimonials" link. 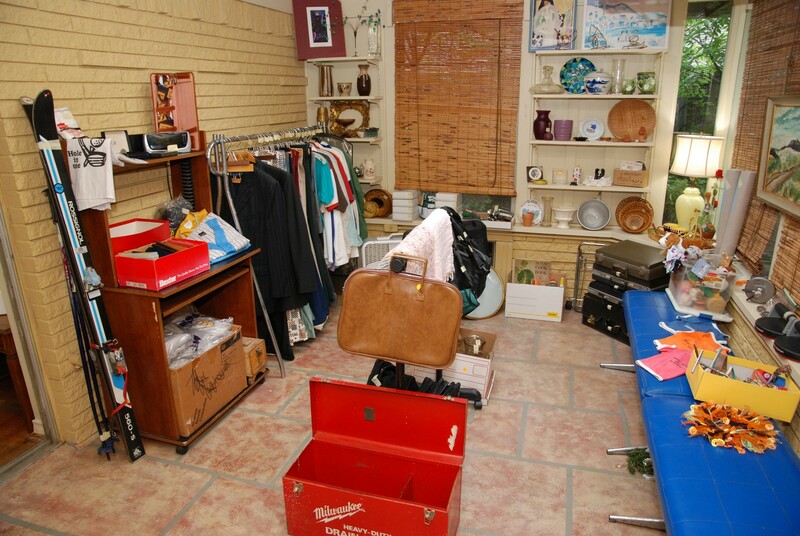 City regulations limit Estate Sale signage, so please use your GPS or the map. Please be courteous and avoid blocking neighbors' driveways or mailboxes. 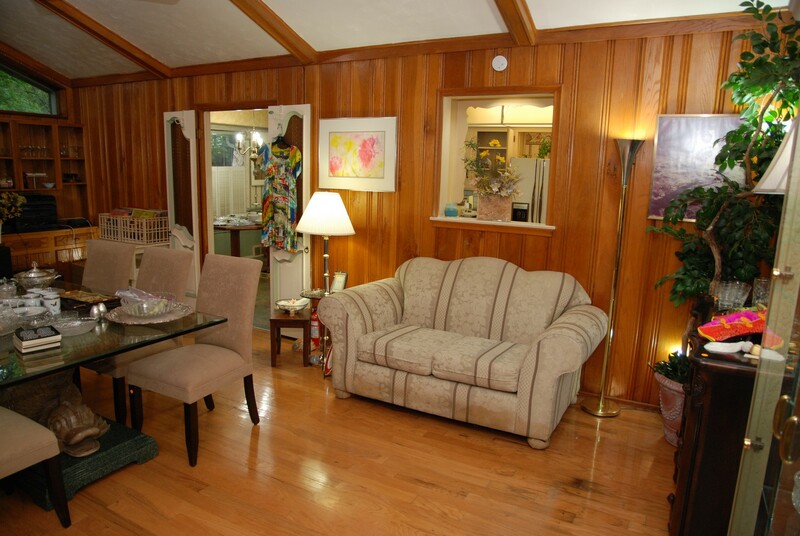 Note: Prices shown on tags in virtual tours are preliminary and may change before the sale starts. 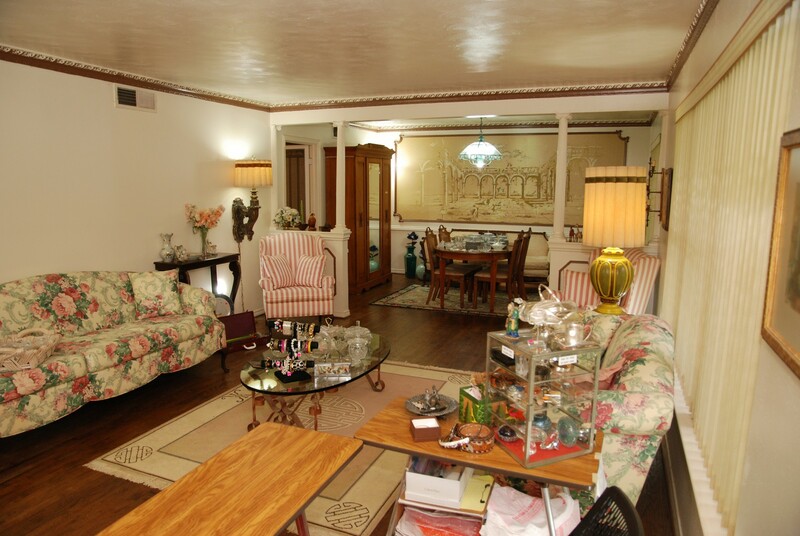 Enjoy our exclusive "Virtual Tour" experience using images* above! * Designed to work on Chrome, Edge, & Firefox browsers as well as Android, iPad, & iPhone mobile devices.
. . . Click on thumbnails to view larger images!
. . . To view our slideshow, click HERE. 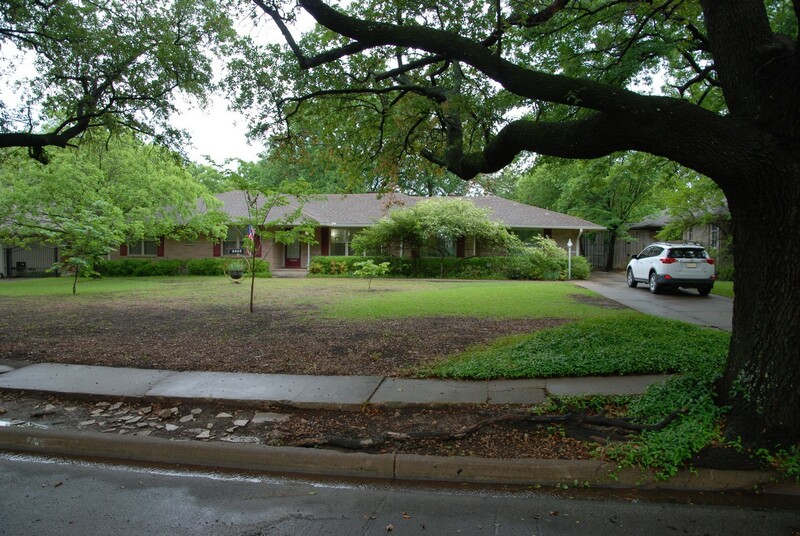 This week we have an eclectic Estate Sale in the Preston Hollow area of Dallas. 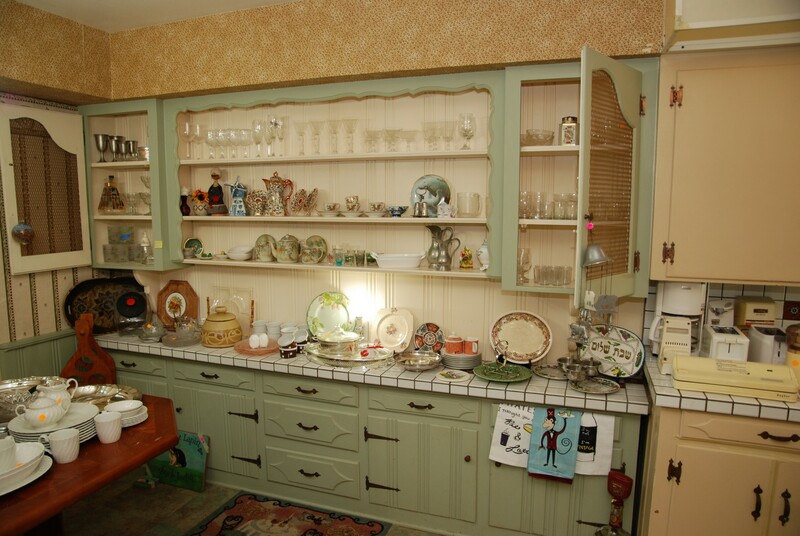 The one-story, traditional home is packed with a very interesting mix of vintage to current items. 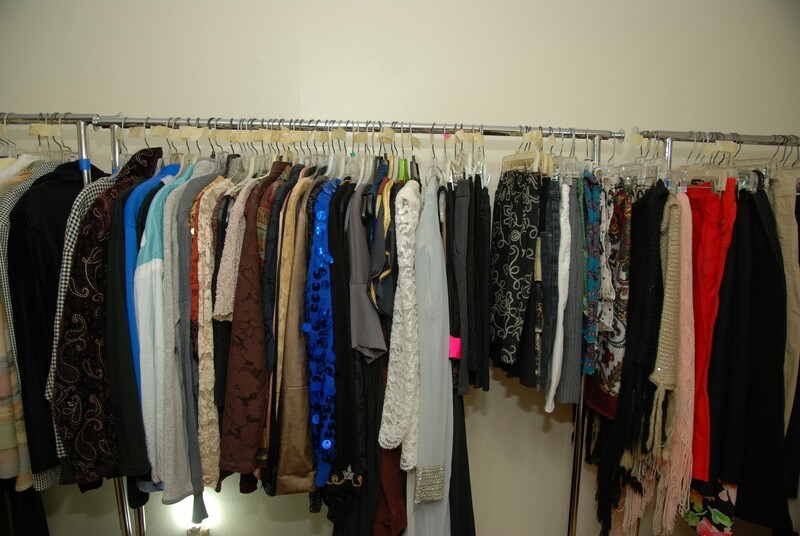 We have clothing mostly for women (sizes extra small petit to large) including a nice assortment of Belly Dancing / Harem Attire - along with a rack of Men’s Clothing (in sizes medium to large). 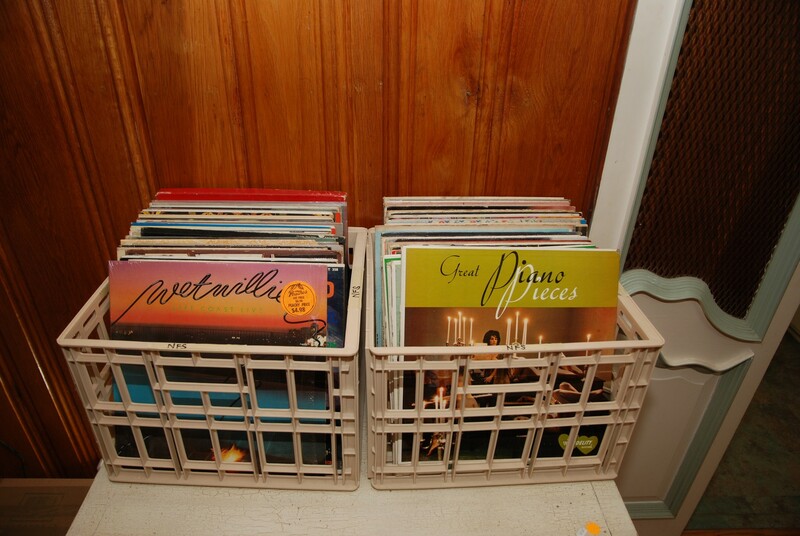 We have a few dozen 33 RPM Record (vinyl) Albums; some nice Costume Jewelry, and some interesting Collectables. Come early for best selection! We will limit the number of people in the house and will distribute sequential numbers to those who are waiting to enter. Thank you for your patience! 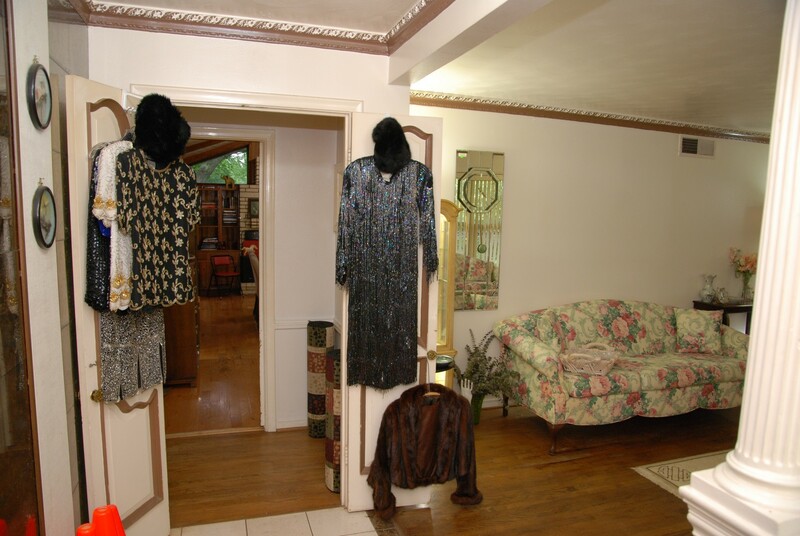 Entry / Living Room, and Checkout Area – features beaded tops and evening dresses along with a vintage mink jacket and some hats. 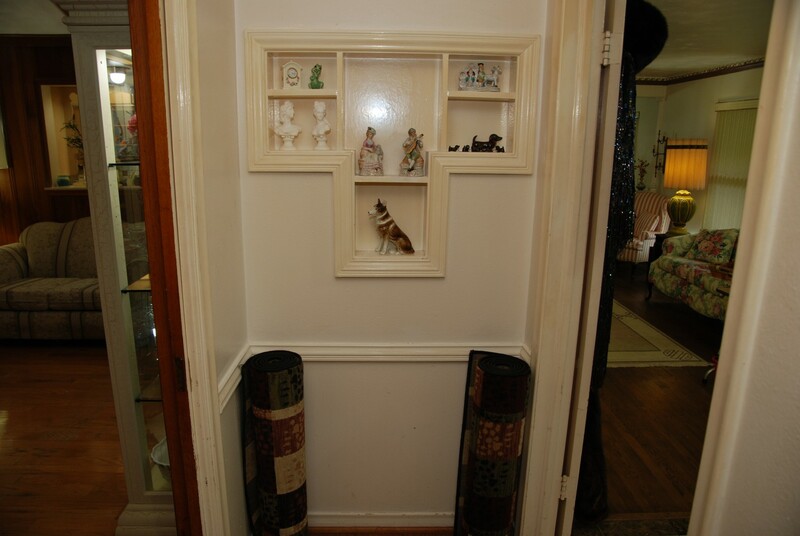 We have a lighted small curio cabinet featuring collectable birds. 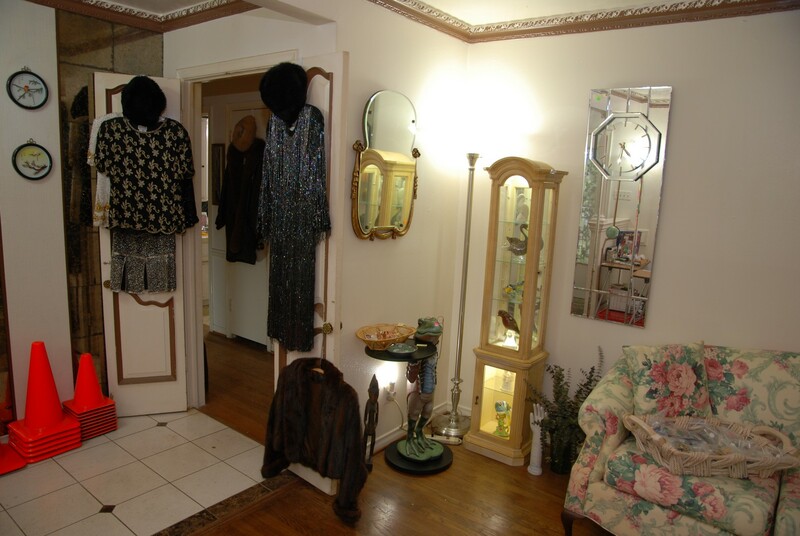 We have a mirrored pendulum clock and an unusually nice vintage mirror. 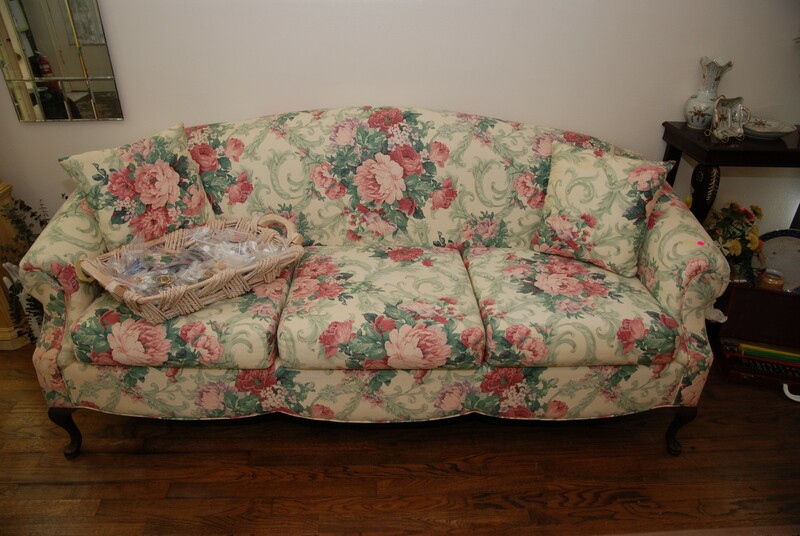 If you like florals, you’ll really like the vintage floral couch and matching love seat with matching pillows. 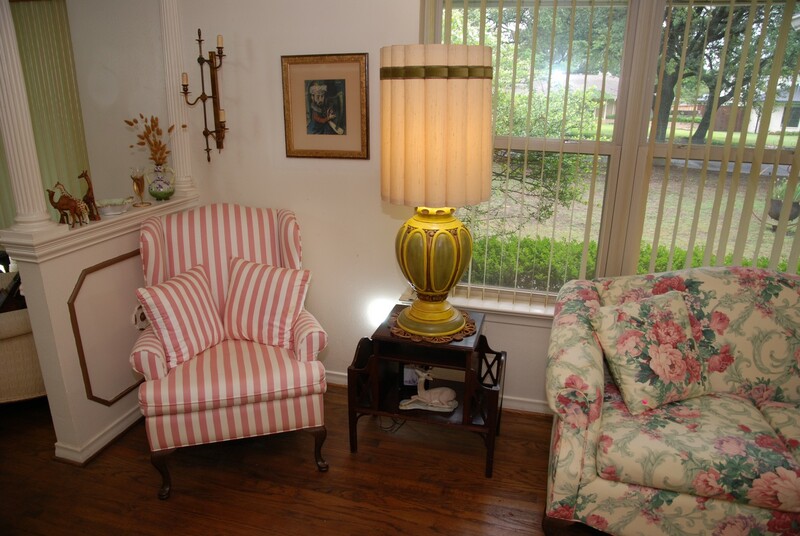 We also have a matched pair of pink and off white striped wingback chairs with matching pillows. These four pieces create a stunning atmosphere. 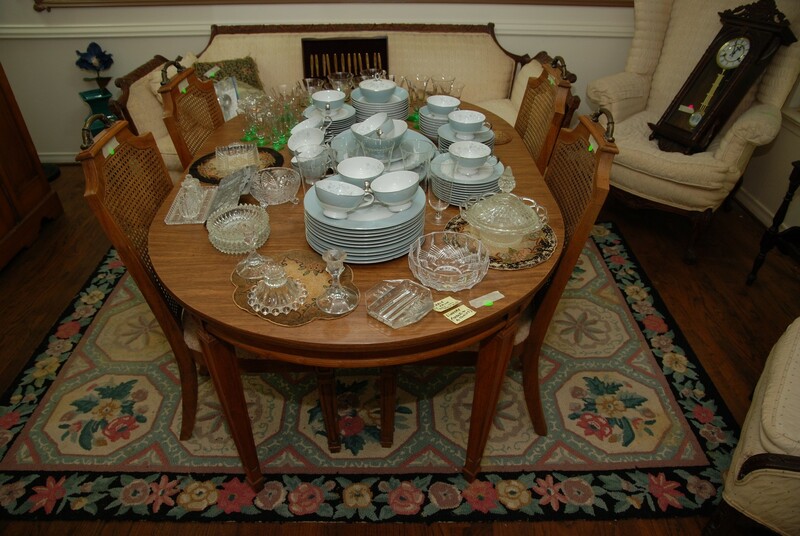 In the center of the living room we have a nice thick glass oval coffee table with wrought iron bottom. 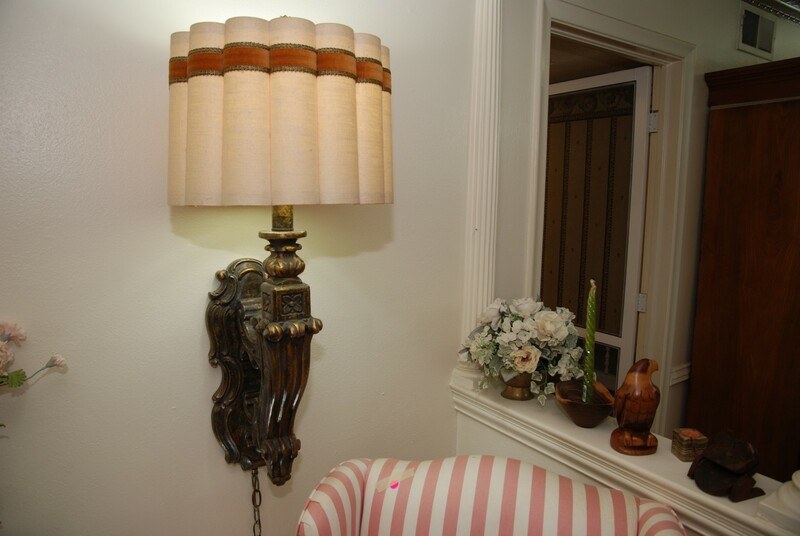 There are some vintage lamps with large shades. One is a table lamp, and the other one mounts on a wall. 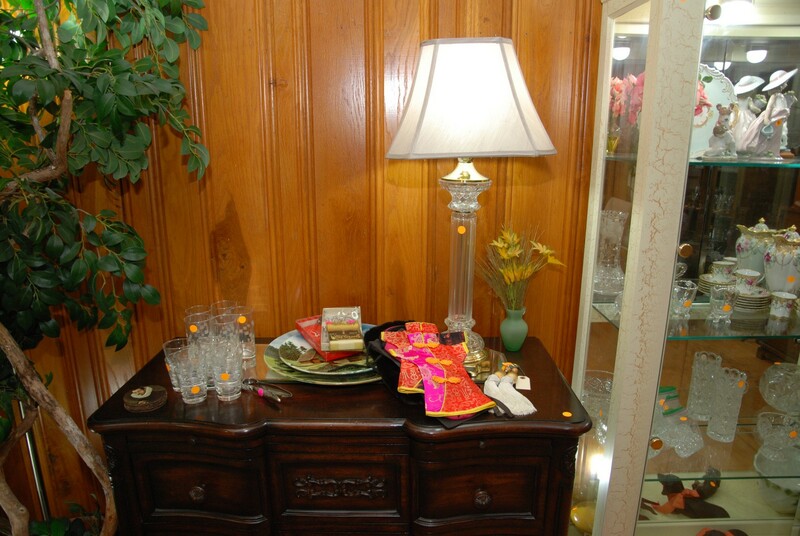 We have a nice mahogany table and a mahogany magazine side-table with shelf. Both are in great condition. 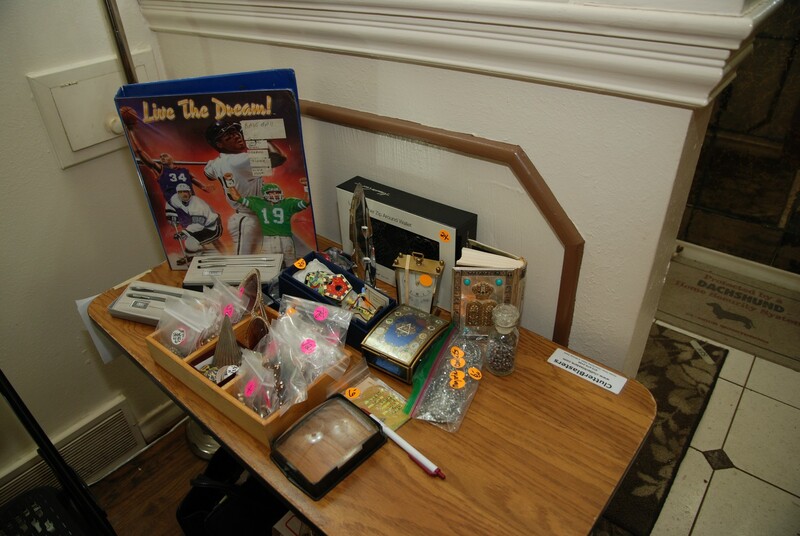 At the checkout table we have some interesting collectables, paperweights, collectable boxes, a few sterling serving pieces, and a notebook holding a baseball card collection (sold by pages). 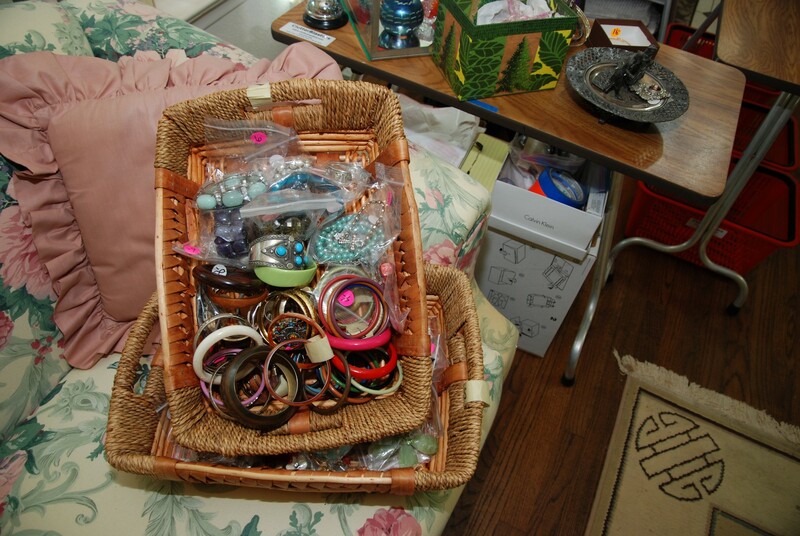 We have a large basket with vintage to current earrings. Please reseal bags after inspection. There are lots of interesting bracelets and hair items. 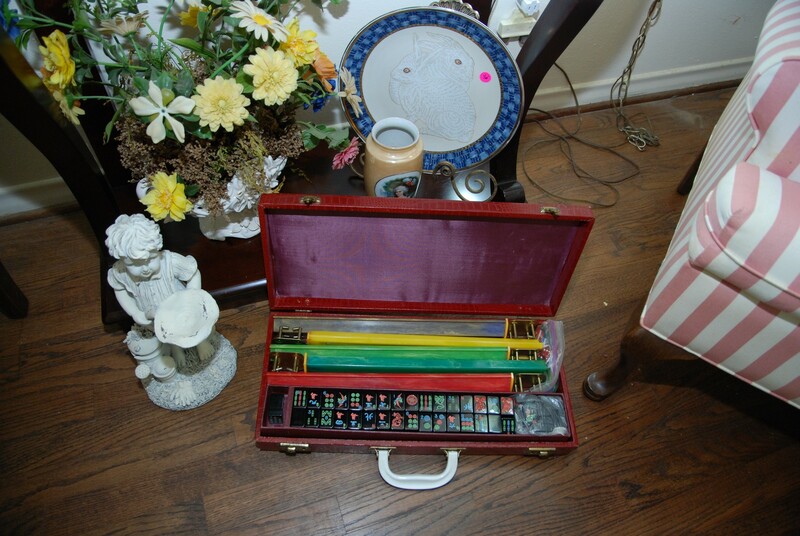 We have pictures, knick-knacks and other very interesting collectables throughout the room – including a very nice Mah Jongg set in a carrying/storage case. Come early for the best selection. 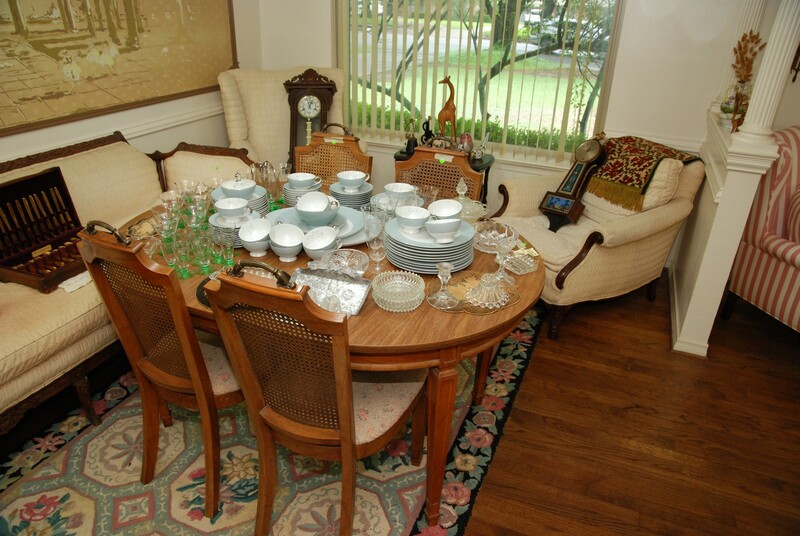 Dining Room – features an oval table (with one leaf) or round table (with no leaf) along with four side chairs. 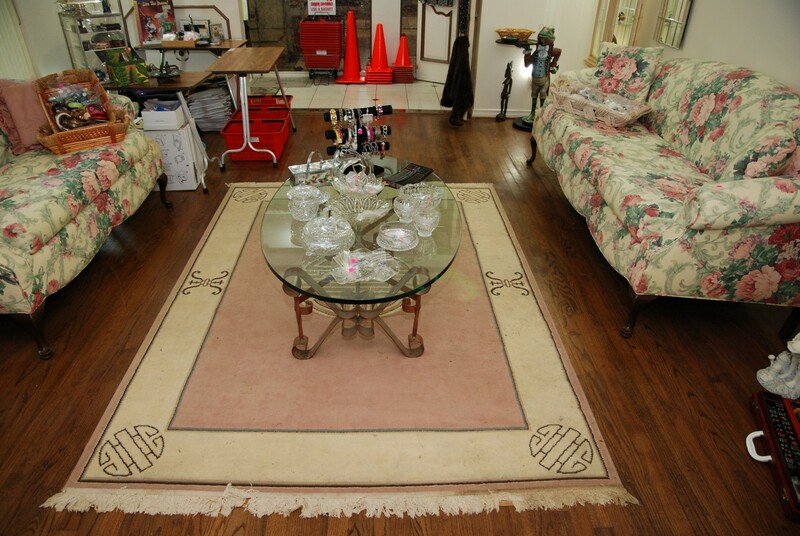 We have an antique long couch along with one high back chair and one low back chair. 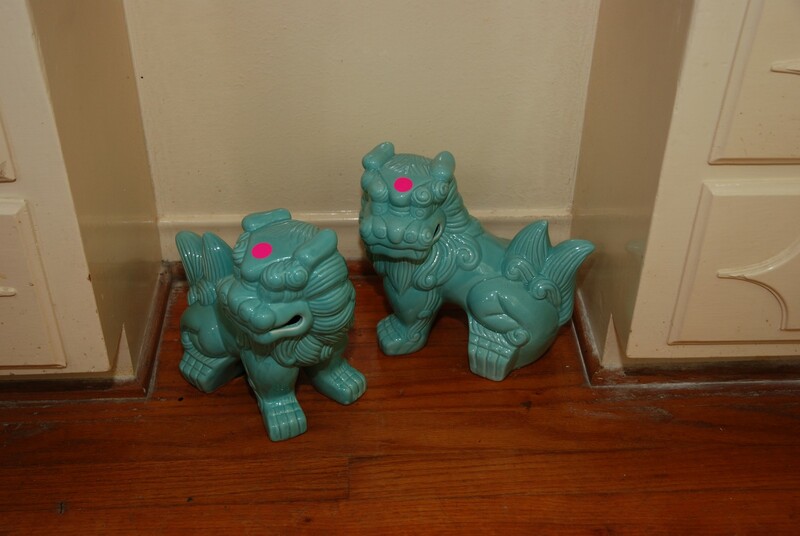 These three pieces are in great condition for their age. 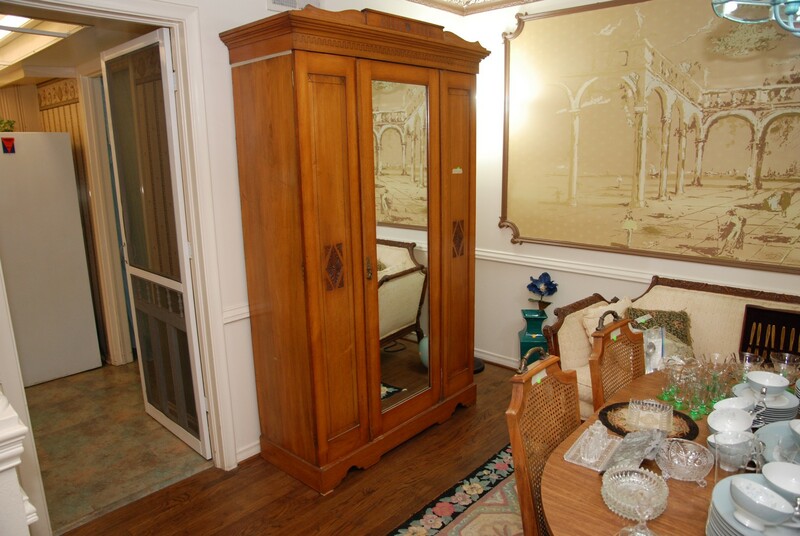 We also have an Art Deco wardrobe closet with a mirrored door in good condition. 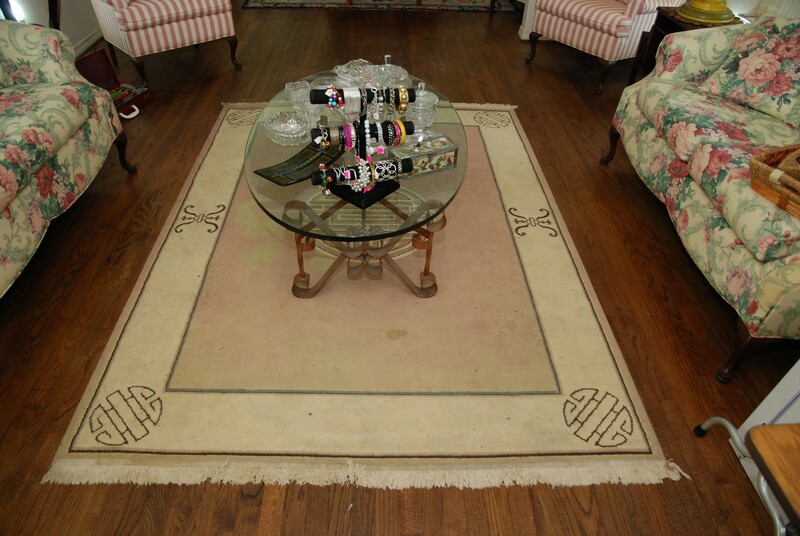 This room has a nice multi-colored area rug as well. We have a nice vintage set of Mikasa Fine China from Narumi Japan – Royal 5295 with some serving pieces. There is also a very nice set of vintage green glasses. 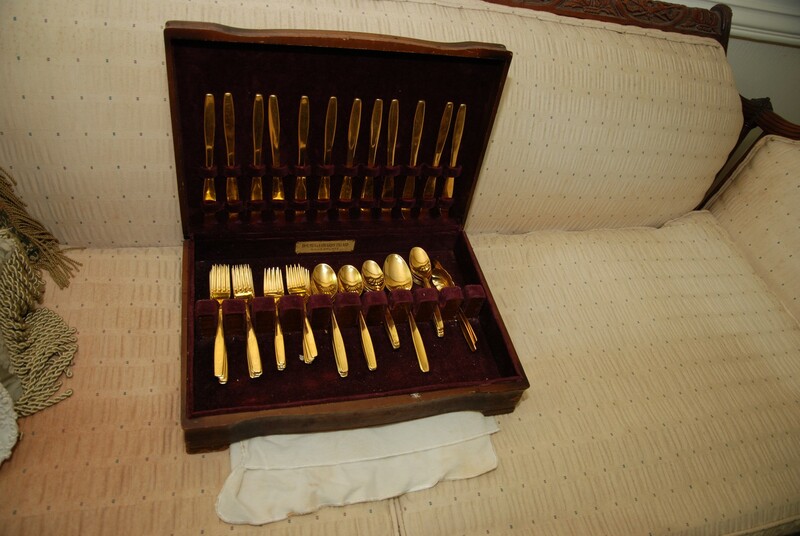 We have a nice set of gold-tone flatware with a vintage wooden case. 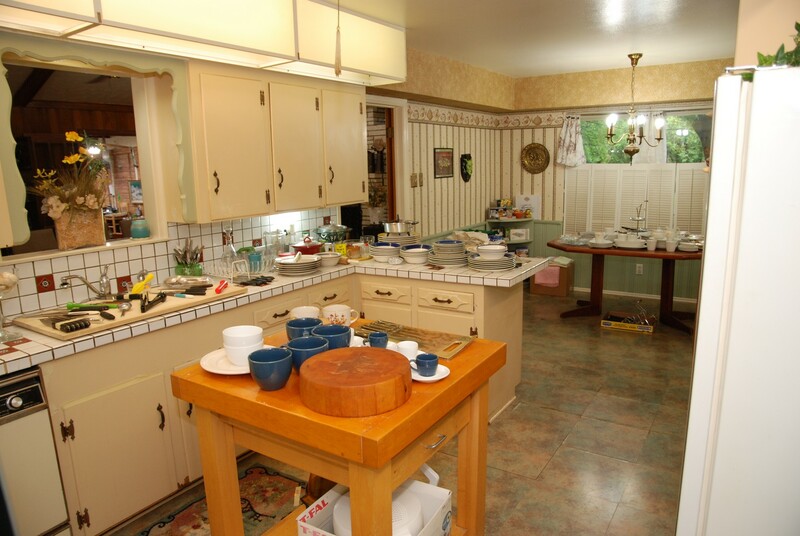 There are two sizes of depression green glasses along with other dishes. 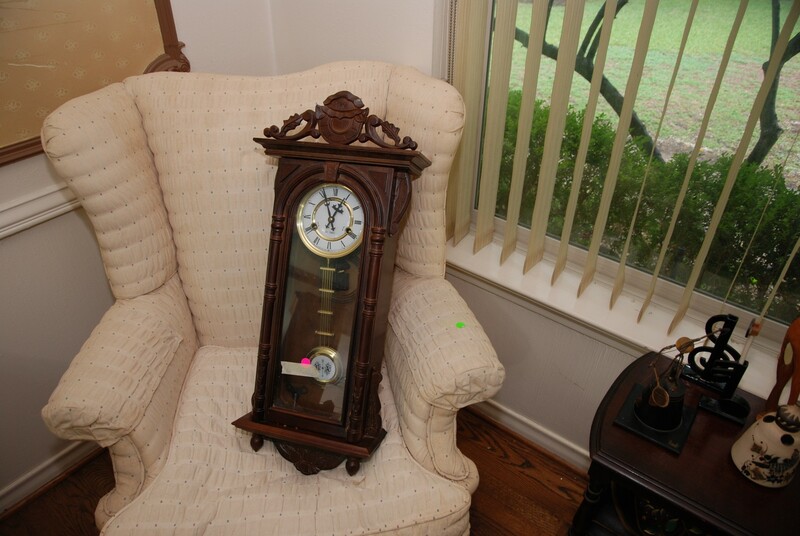 We have two vintage wall-hanging clocks and a bookshelf mahogany side table. 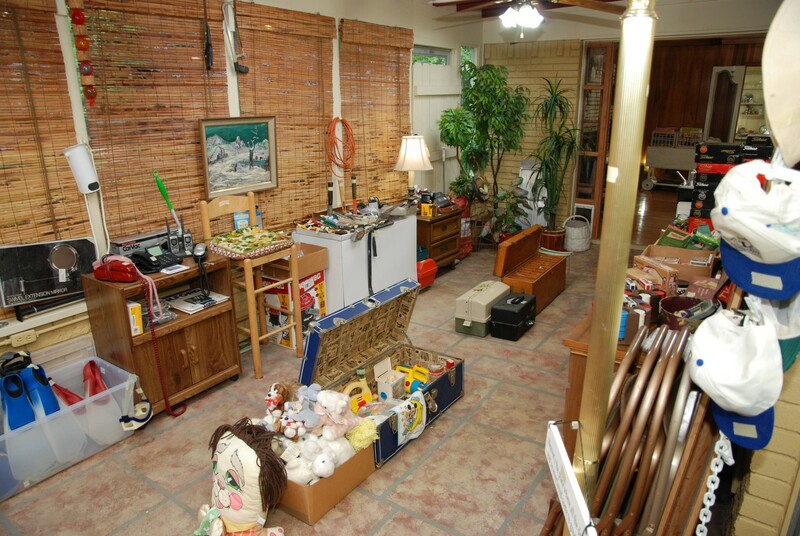 This room features many interesting knick-knacks and collectable figurines as well. 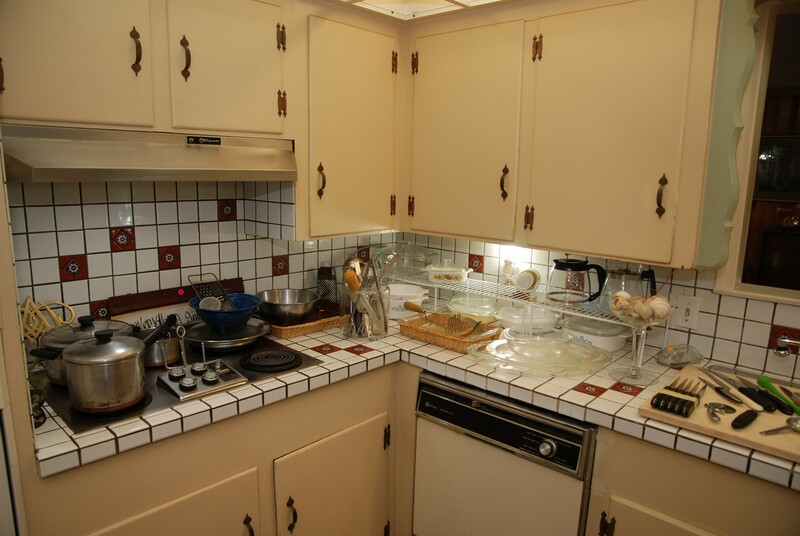 Kitchen / Eating Area – features a nice Omaha Steaks heavy duty solid wood island with drawer. There are large soup cups and a nice new knife set. 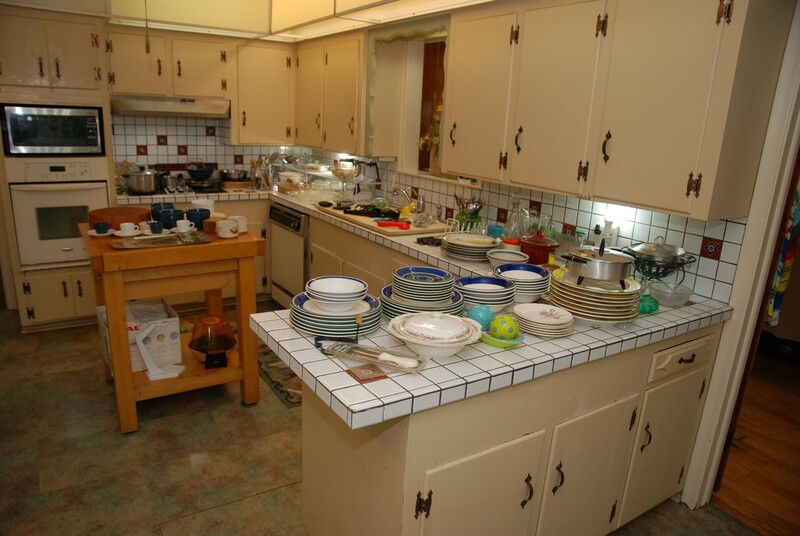 We have some pots and pans and Corning and Pyrex casserole dishes. 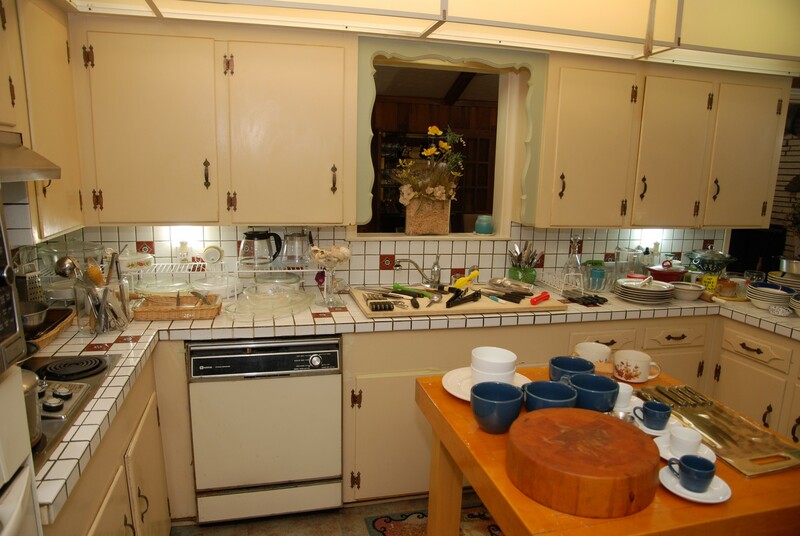 We have serving plates, coffee pots, and large board almost filled with assorted knives. 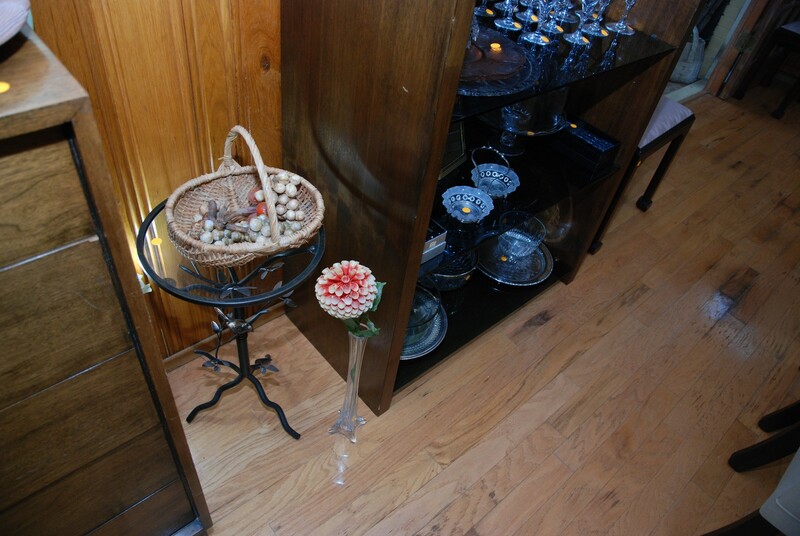 We have assorted utensils and a large martini glass full of seashells. 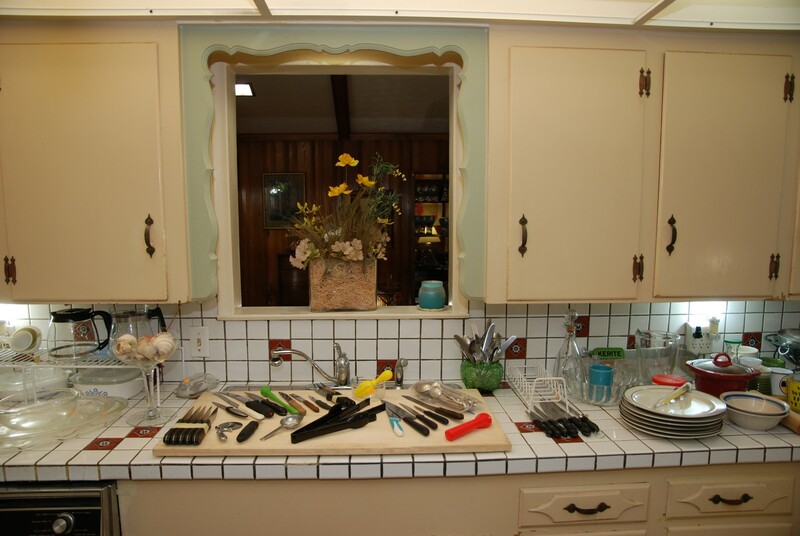 We have assorted flatware, serving pieces, and different size plates. 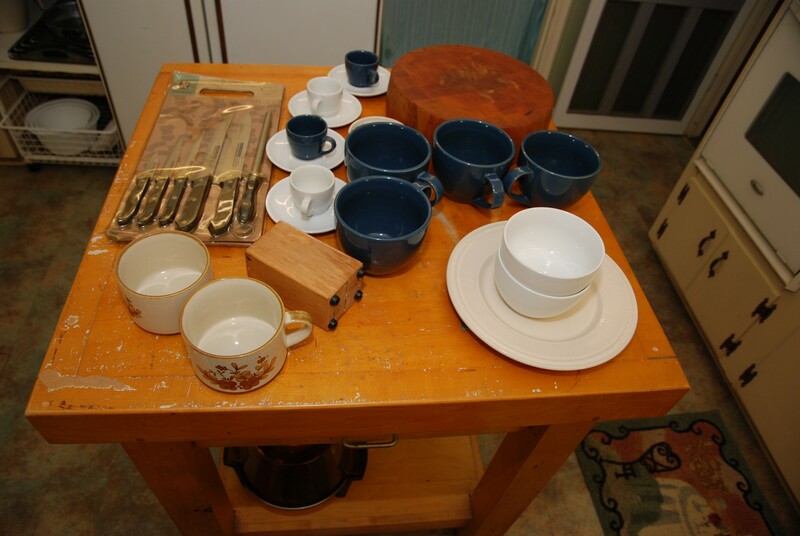 There are some interesting and unusual collectable coffee cups and a nice set of Gibson china in blue and white. 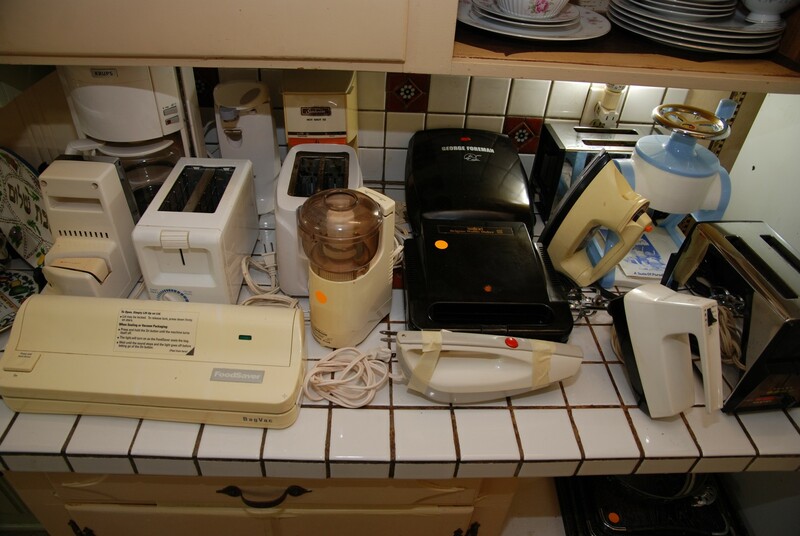 There are lots of small appliances like toasters, a hand mixer, an electric carving knife and a small George Forman grill along and an ice shaver. 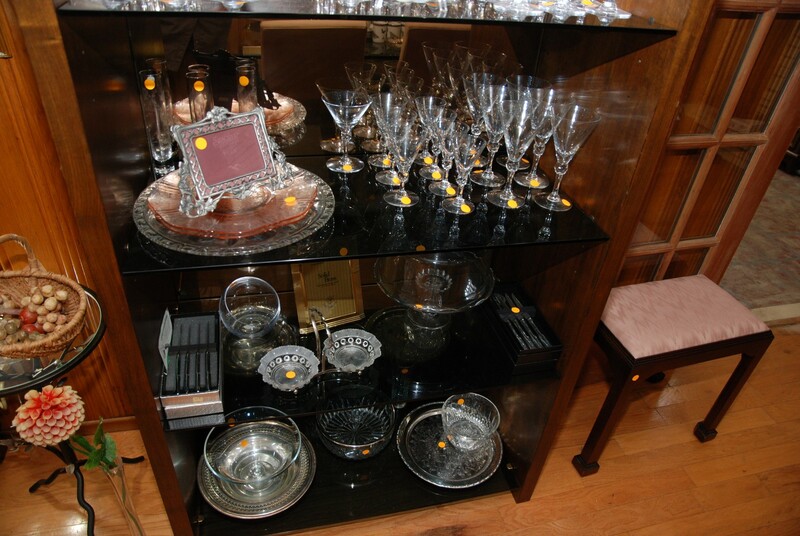 We have a set of four nested trays, everyday glasses, and assorted drink glasses in various sizes. 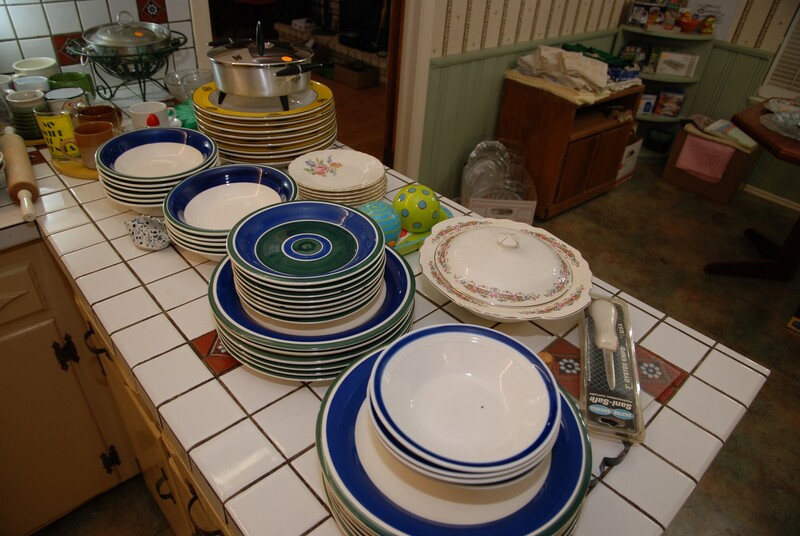 We have collectable plates, vintage sets from Asia, and a set of white dishes from England. 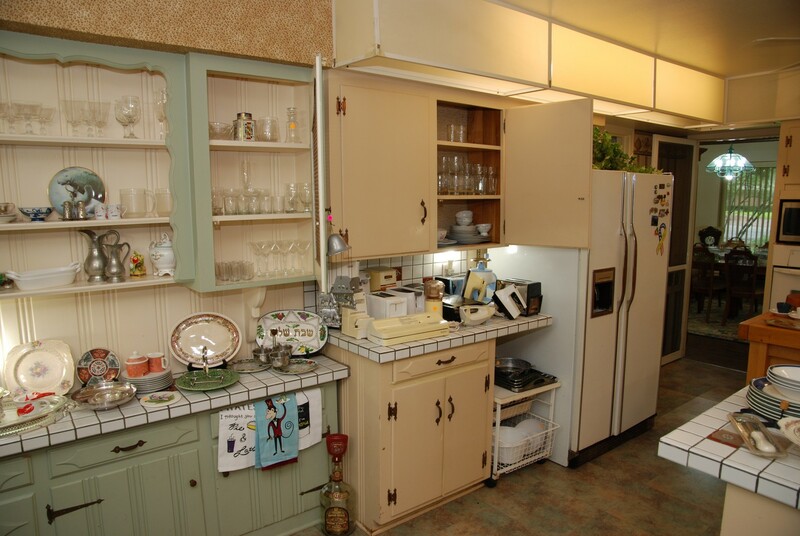 There are many new items (still in boxes) on the corner unit in the eating area. 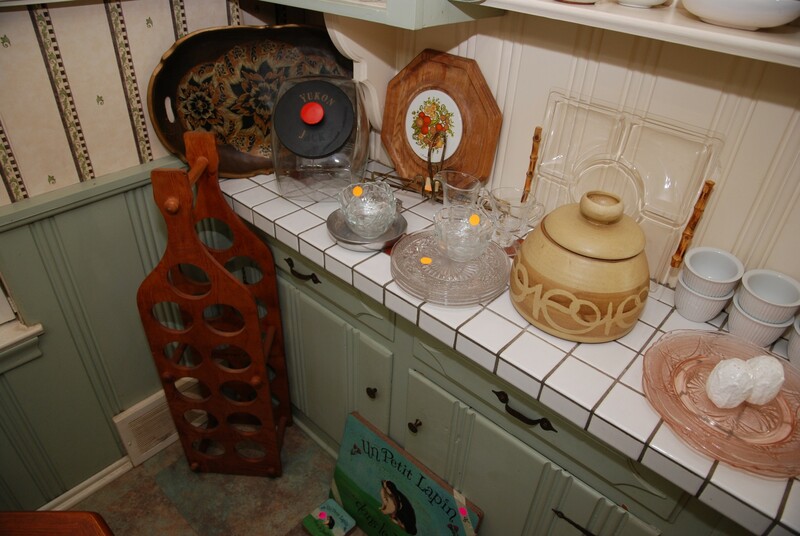 We have a wooden wine caddy, unusual dishes, and assorted kitchen décor. 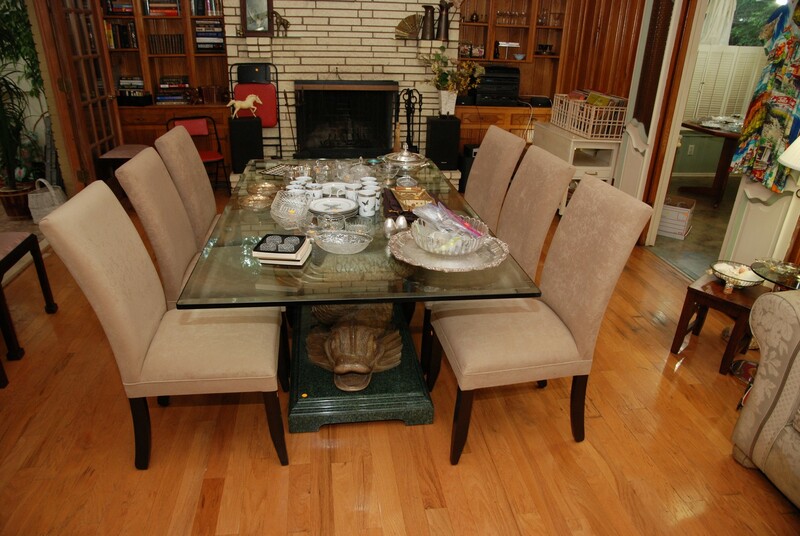 The vintage Oak table has a modern flair (no chairs). 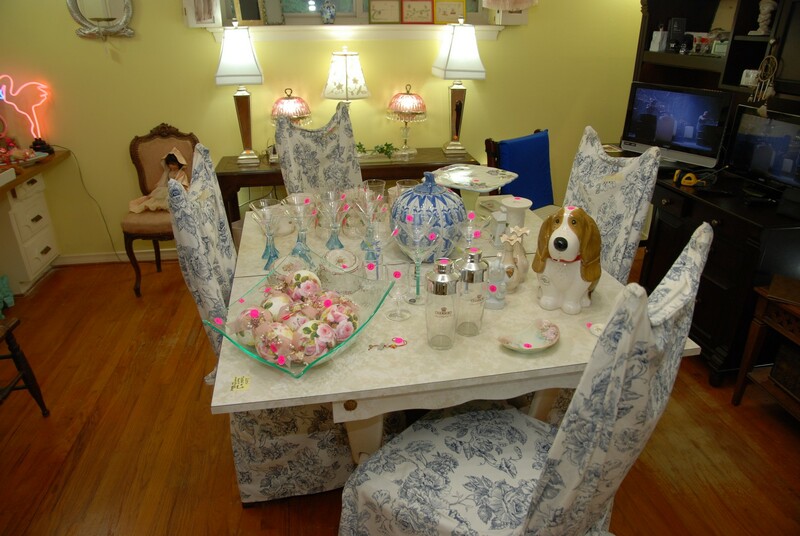 We also have some table linens and hand towels. 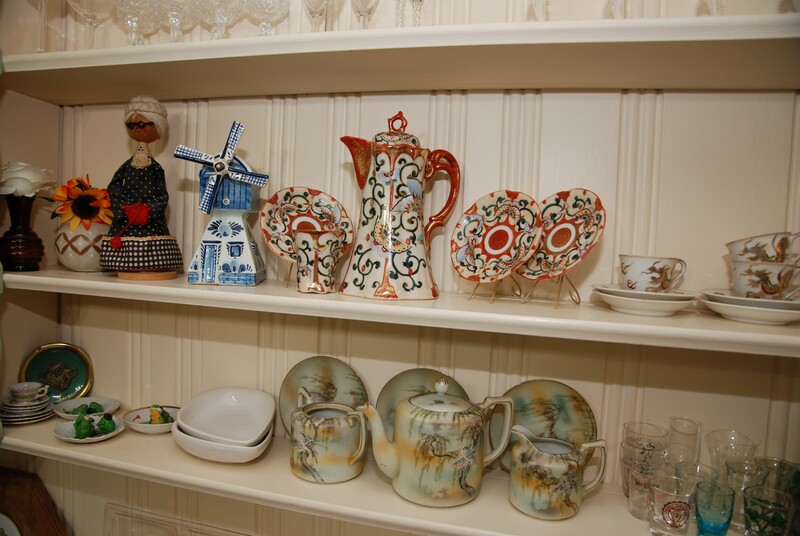 There are many unusual serving dishes and trays. Come early for the best selection. 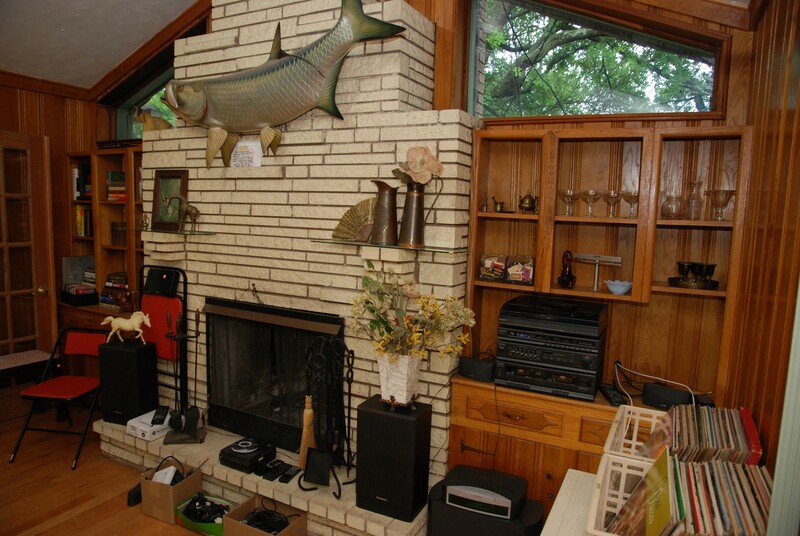 Large Family Room – features a great selection of 33 RPM vinyl records. There are albums by Eddie Arnold, Gladstone, Leo Kottke, Staple Singers, Sandra Church, Ace, Pearls Before Swine, The Eleventh House, Music for Mixed Emotions, The First Family, Beatles – Let it Be, Mary Poppins, Cleopatra Sound Track, Jimmy Dean, Trini Lopez, Johnny Thunder, and Bobby Blue Band. There are dozens more, so come early for the best selection. 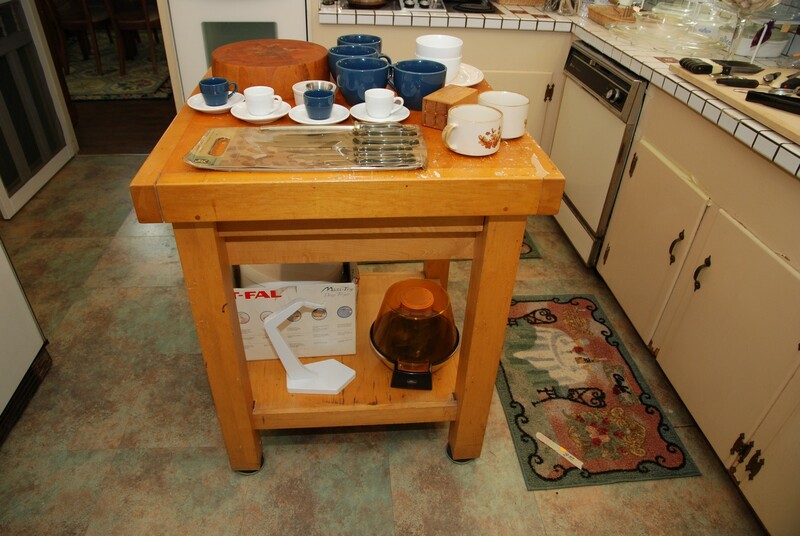 We have a nice serving cart with two shelves, and the sides flip up to make into a nice large serving table (or even a small card table). 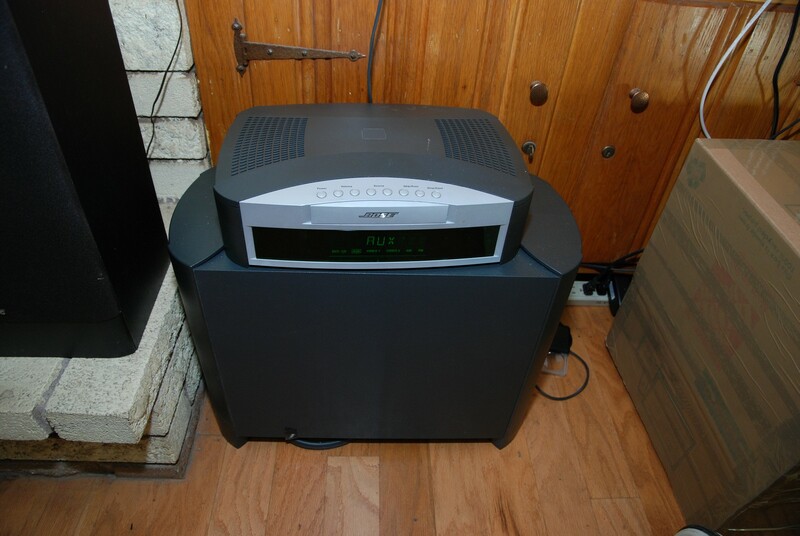 There are two sets of fireplace tools, a Bose sound system with two bookshelf speakers and a subwoofer (the CD sticks), as well as a Panasonic bookshelf stereo system. We have some interesting books and coffee-table style books. There is a large Tarpon fish caught before the regulations changed to prohibit mounting of Tarpons larger than 40 inches. 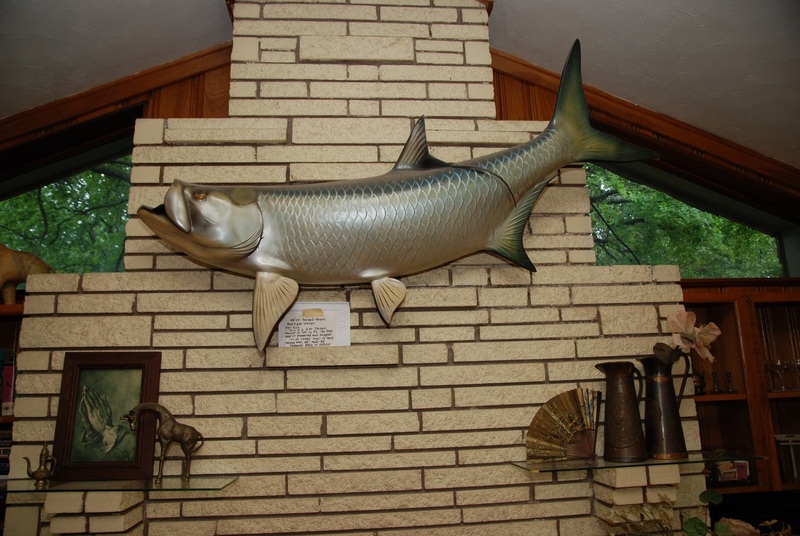 This large specimen was caught in the 1970’s. 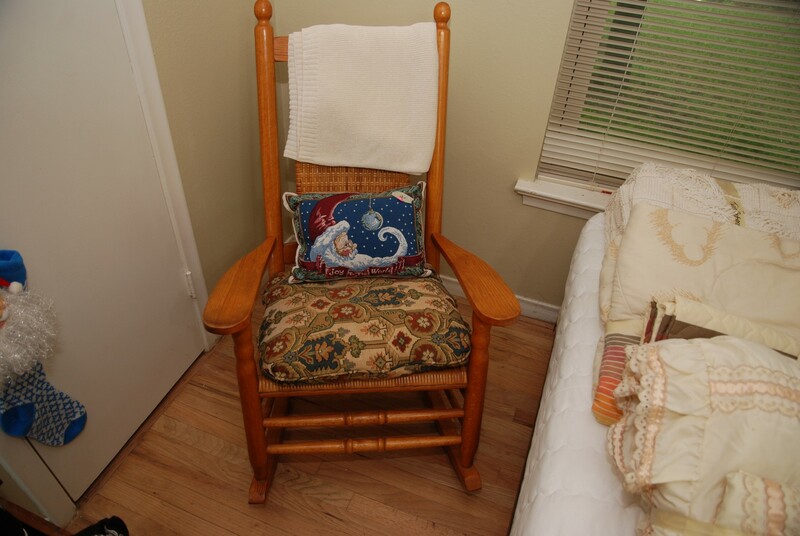 We have some nice small benches and two great folding chairs. 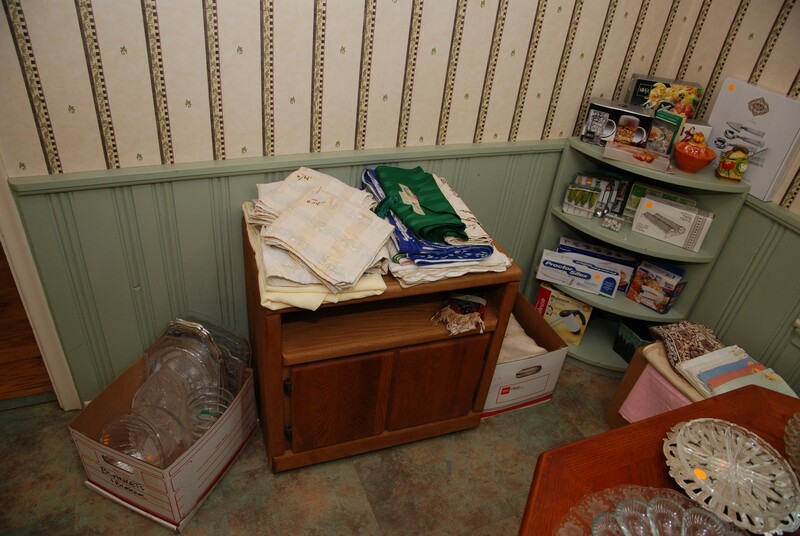 We have a very interesting menu collection - mostly from the New York area. 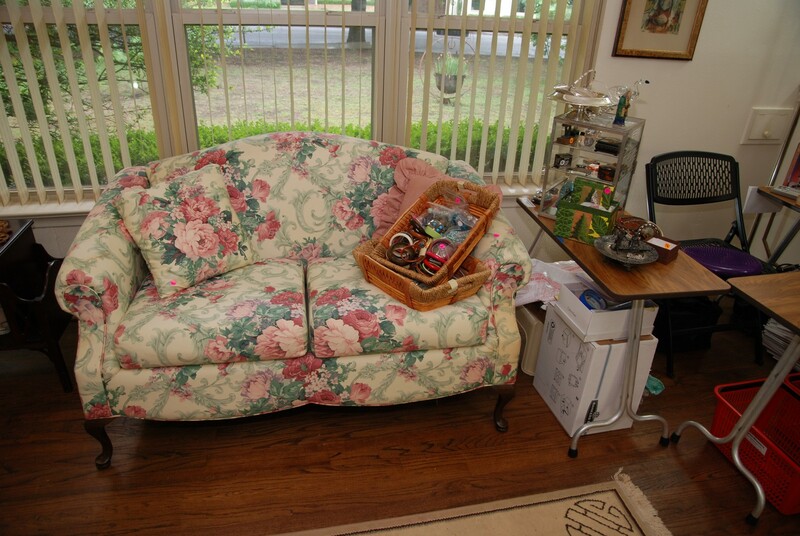 We have a nice love seat and a small glass table with lamp and shade. 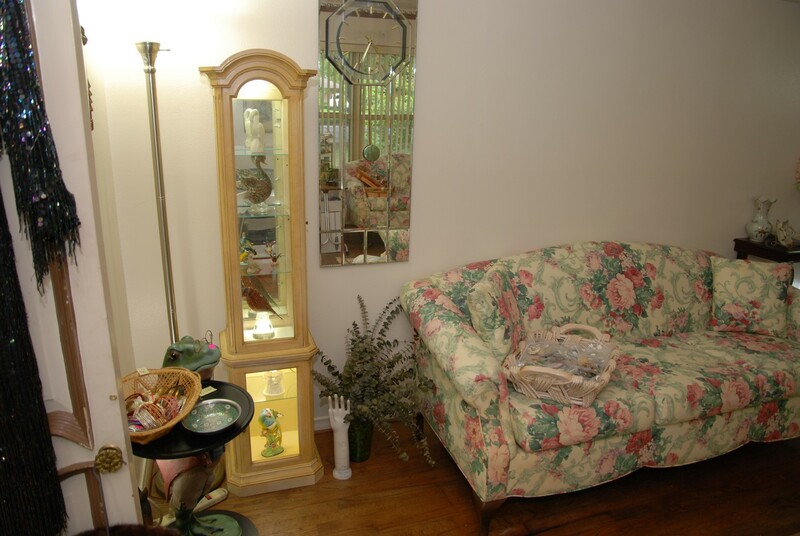 There are many pictures on the wall and interesting vases. 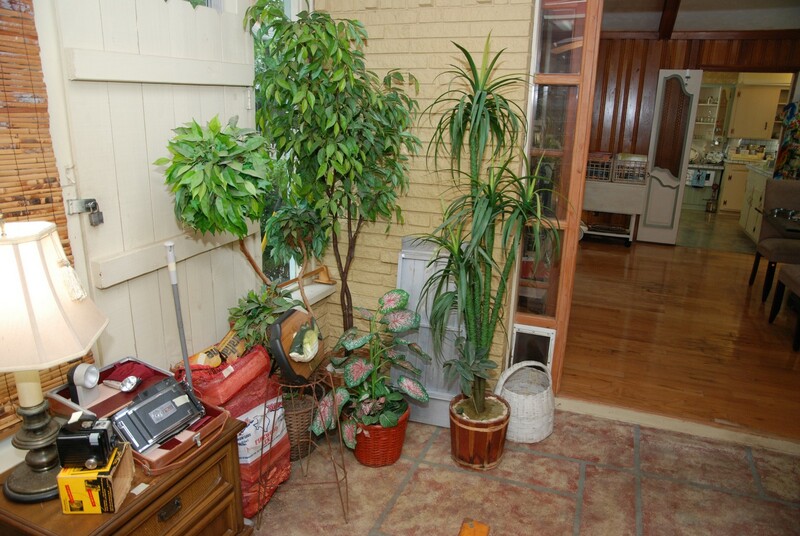 We have a large imitation tall tree in a pot. 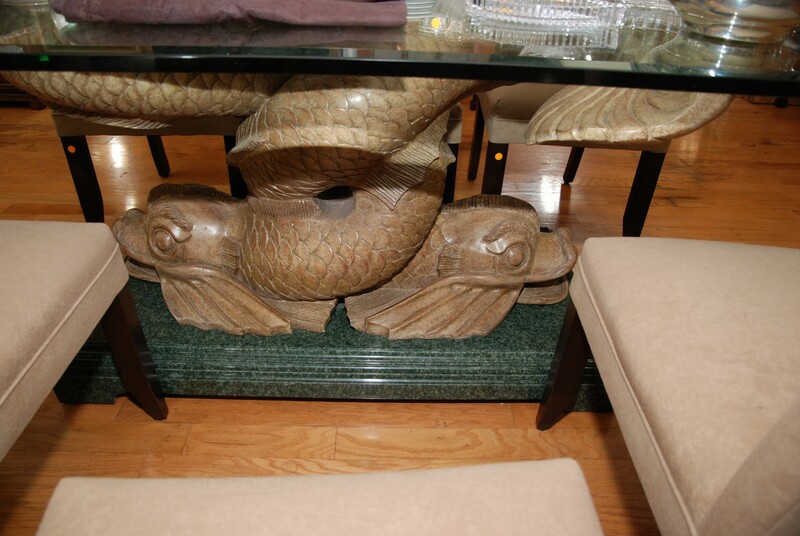 We have an unusual dining table with a large rectangle beveled glass top with two large fish as the base. Their tails support the glass top. This table is a very rare find. 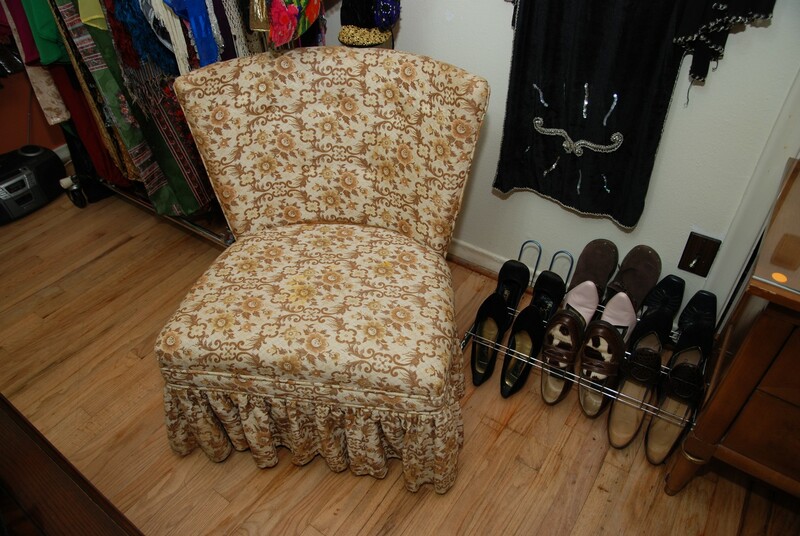 There are six microfiber covered armless upholstery chairs in an off-beige color (sold separately). 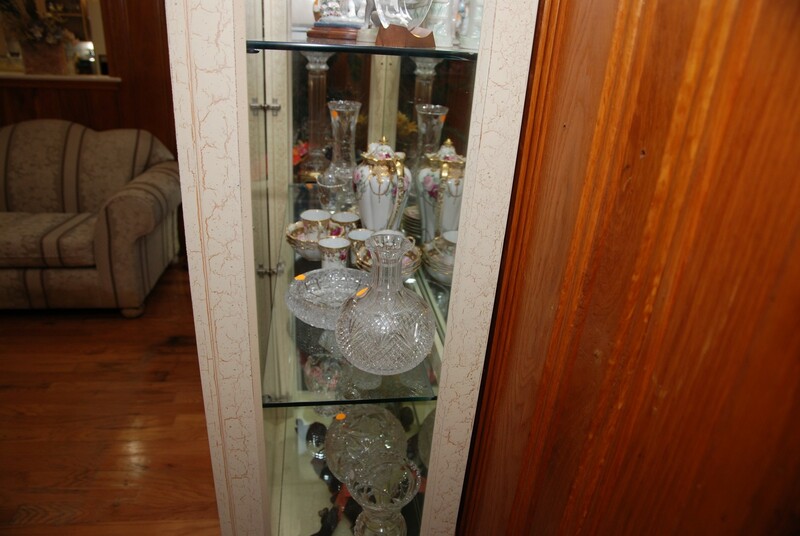 We have assorted crystal bowls and serving pieces. 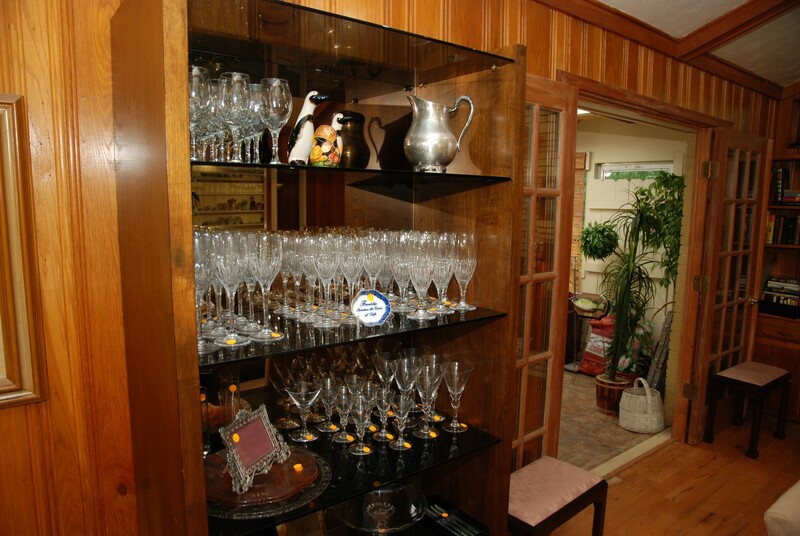 We have Mikasa crystal glasses for water, champagne, and wine. 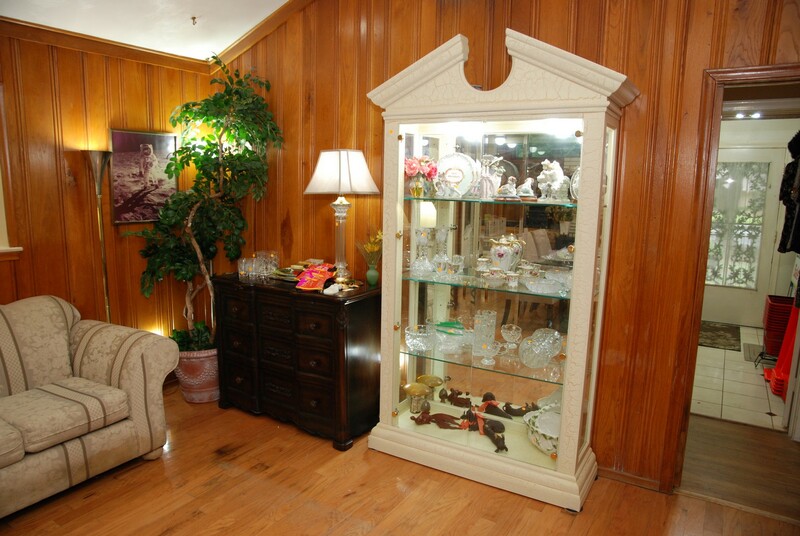 There is a great display case with smoke glass shelves with very heavy wood sides and a mirrored back. 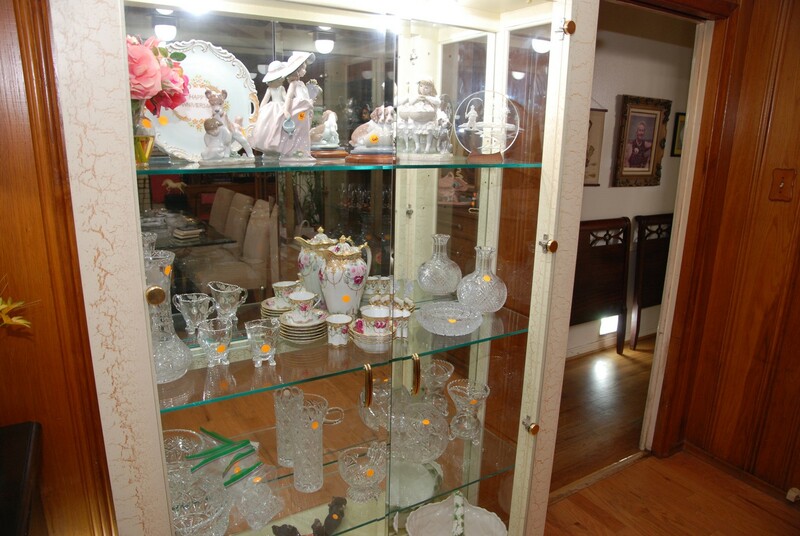 We have a very nice lighted china display cabinet with glass shelves and beveled glass doors. 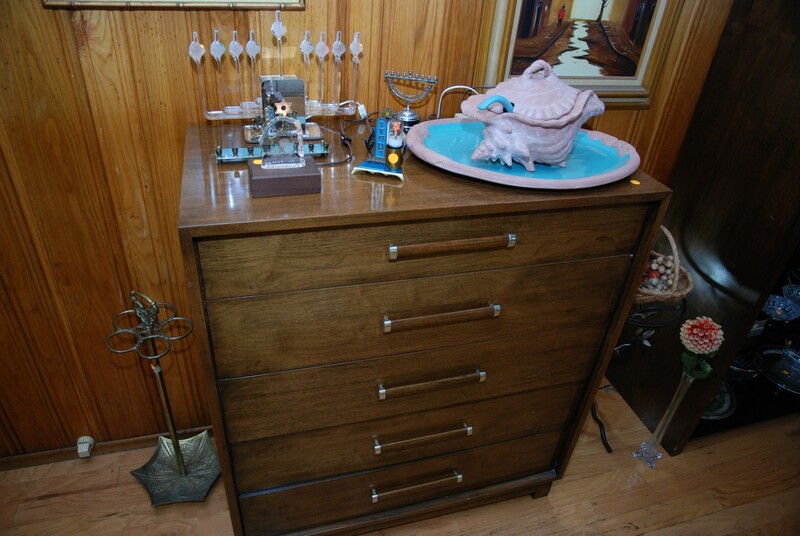 The wood on this is light and the unit has a nice rounded top. 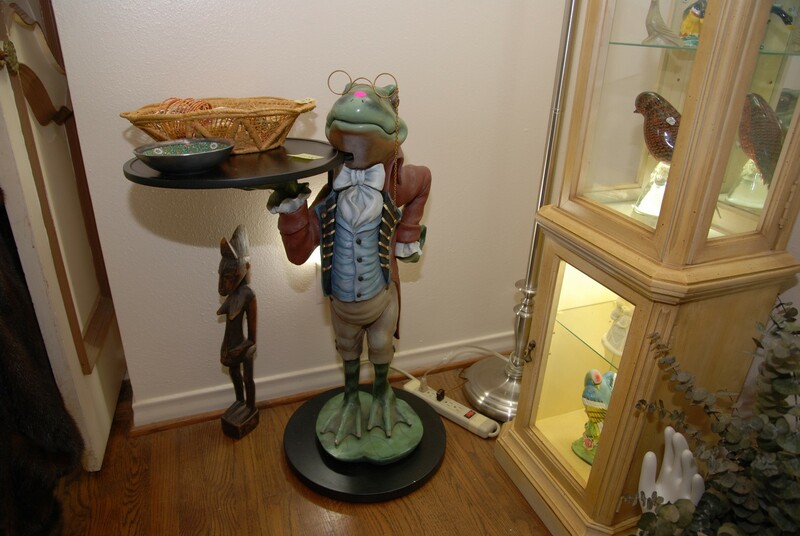 We have some Lladro figurines and more crystal items in the case. 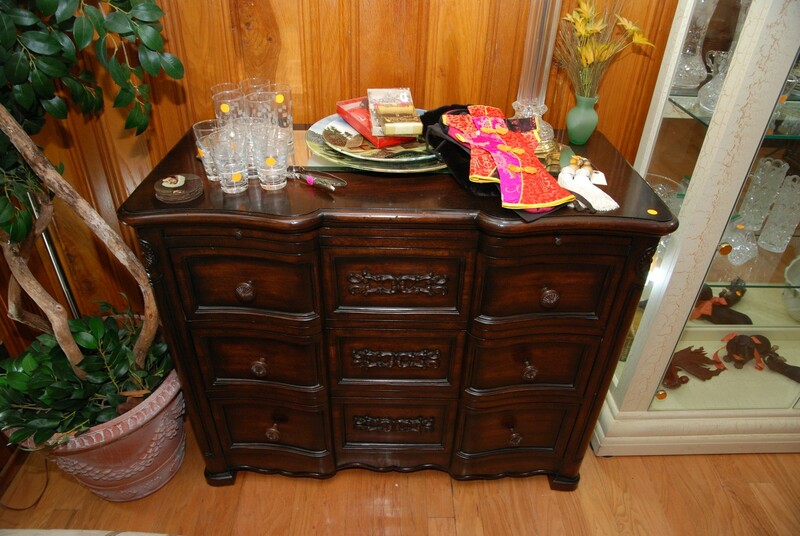 We have a nice small chest / storage piece and a modern chest with drawers. These are nice solid wood pieces. 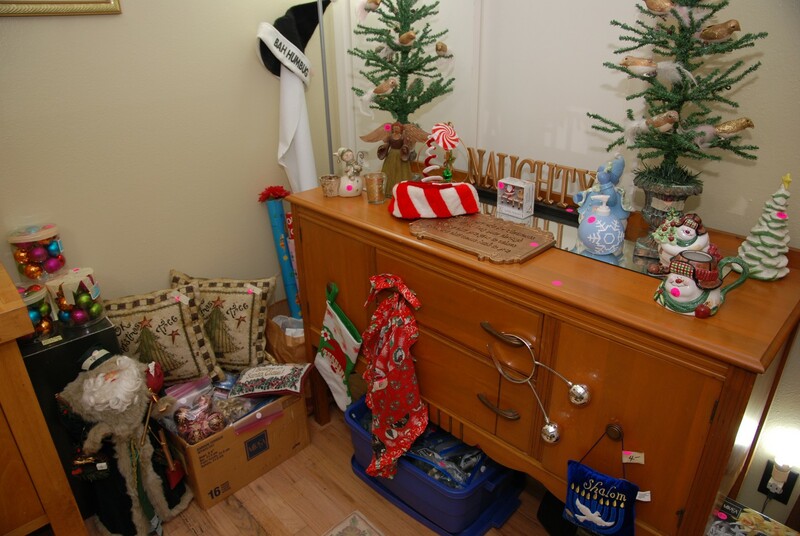 We have a collection of Menorahs (some are lighted). 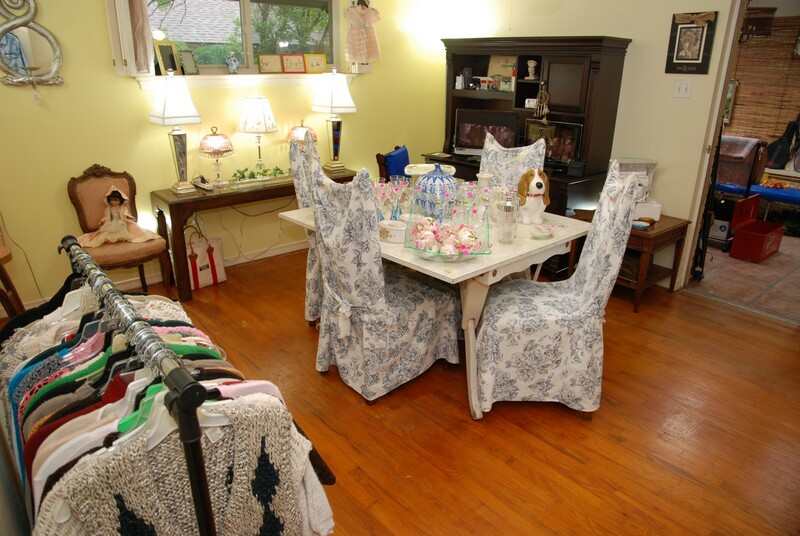 We have some unusual pieces in this room so come early for the best selection. 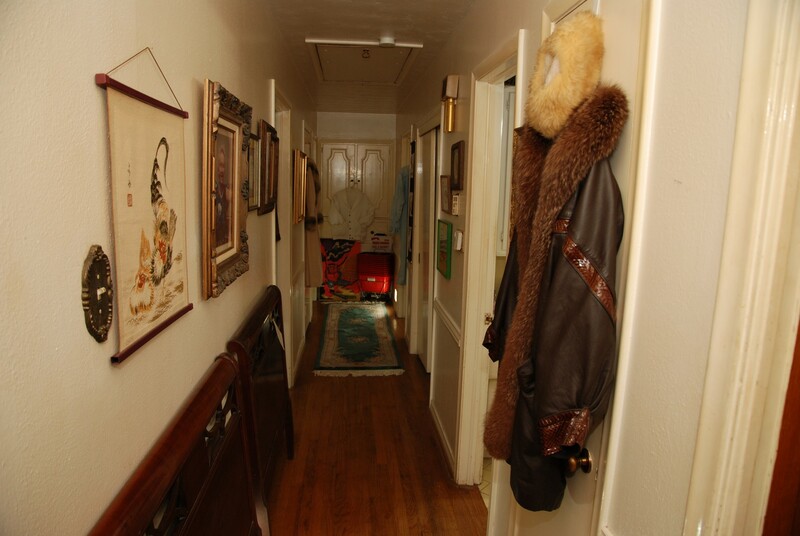 The Hallway - features two mahogany headboards (about 1900’s). There are also some nice pictures - some with great frames. 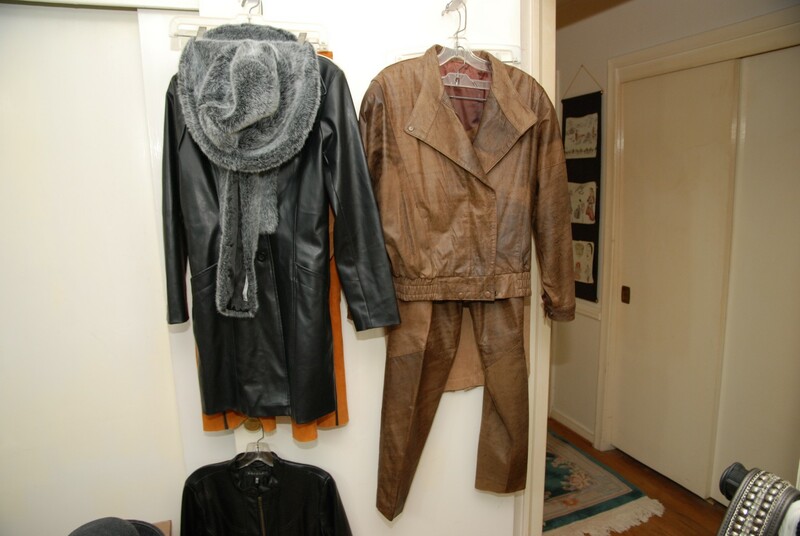 We also have some nice clothing including a vintage leather and fur ¾-length coat and a vintage off-white coat. 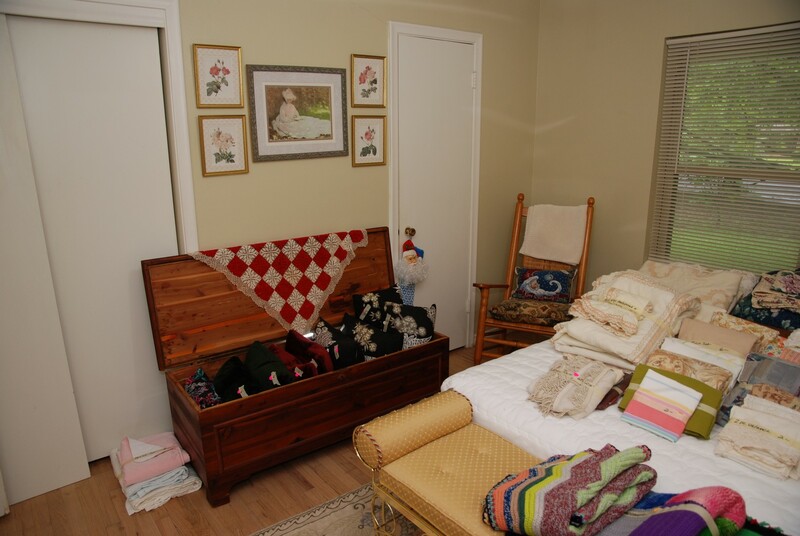 There are some nice knick-knacks on the built in shelf, two rolled up runners, and a nice wool runner on the hall floor. 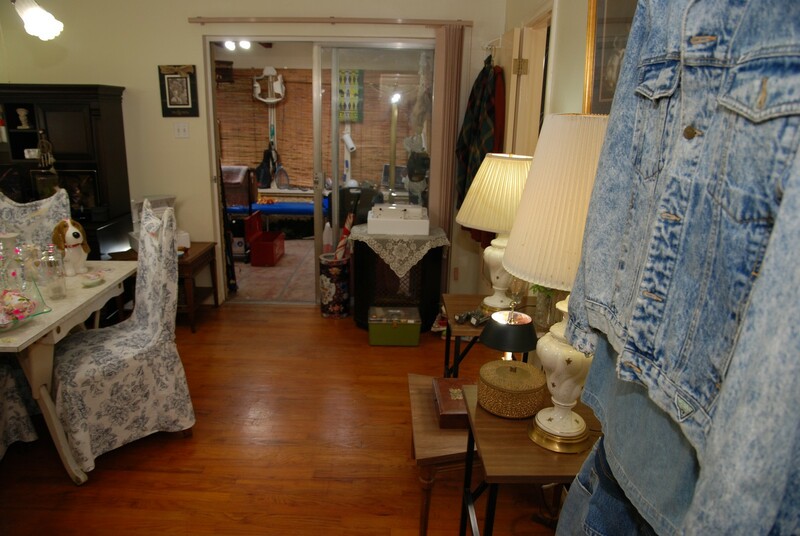 At the end of the hall we have some denim clothing and a white jacket. 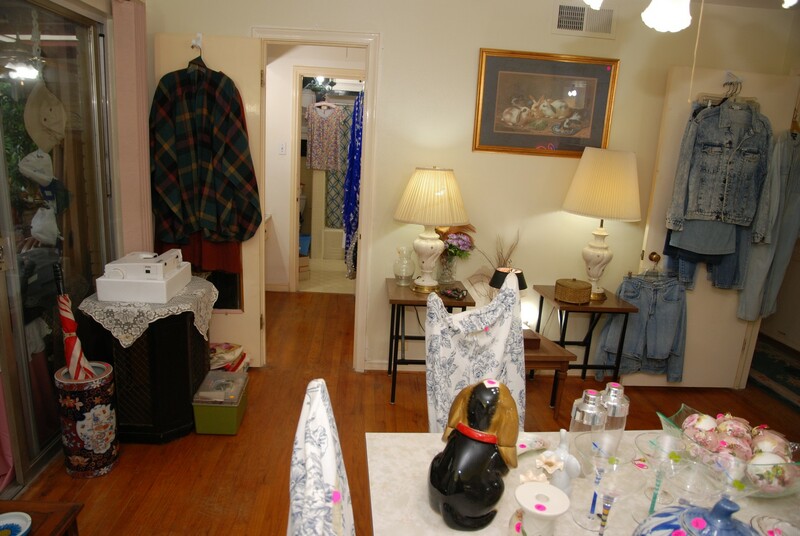 Front Bedroom / Boutique – features five racks of clothing. 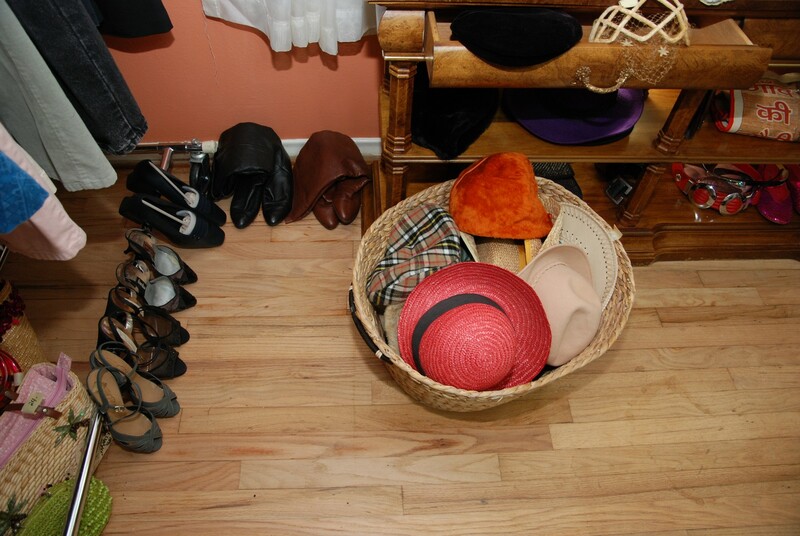 We have hats, purses, shoes and belts. There is an awesome large square solid wood coffee table and a nice large TV stand along with two drawers and four shelves. We have an entire rack dedicated to belly dancing / harem attire. There are many beaded items associated with the belly dancing / harem costumes. 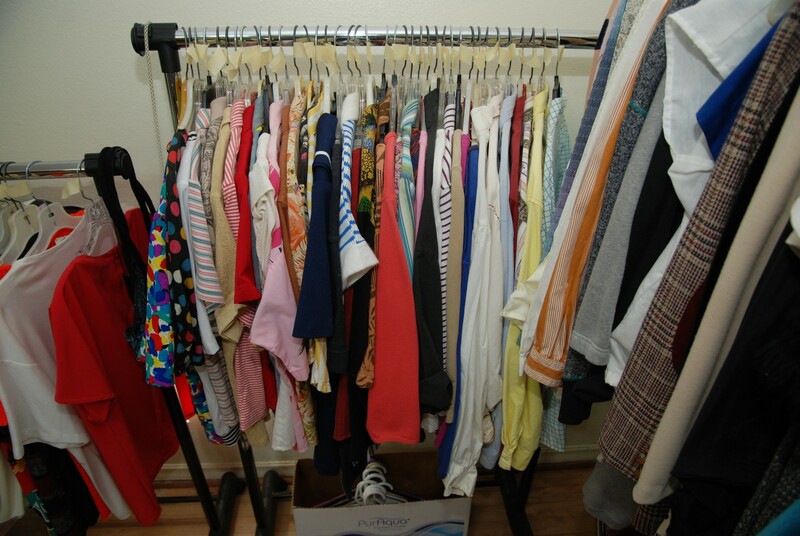 The clothing labels include: Emanuel, Talbots, Ann Kline, Norma Kamala, Neiman Marcus, Liz Claiborne, Isaac Mizrahi, Papa Gallo, Breckenridge, Carol Little, Jones of New York, Rafael, Express, Nicole Miller, Valentino Boutique, Ralph Lauren, Adolphus, and more. 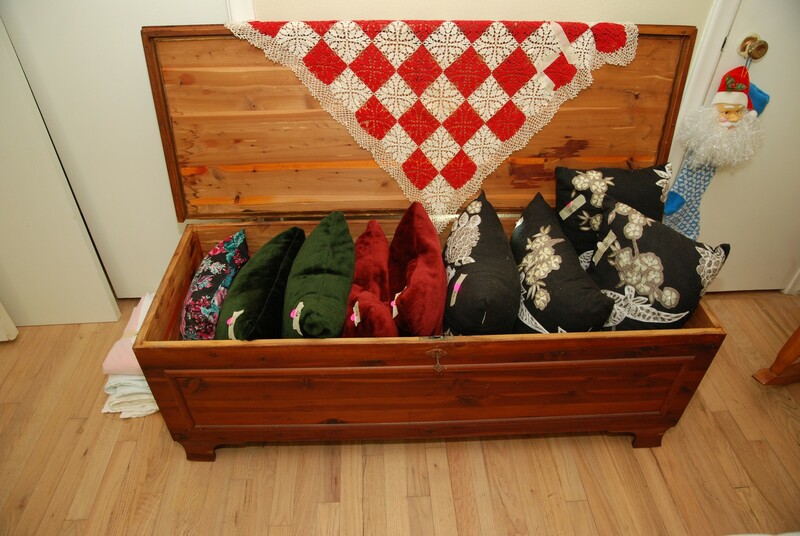 We have scarves, hat boxes, shawls, and jackets. We even have prayer worship wings. We have some leather and suede items as well. Come early for the best selection here. 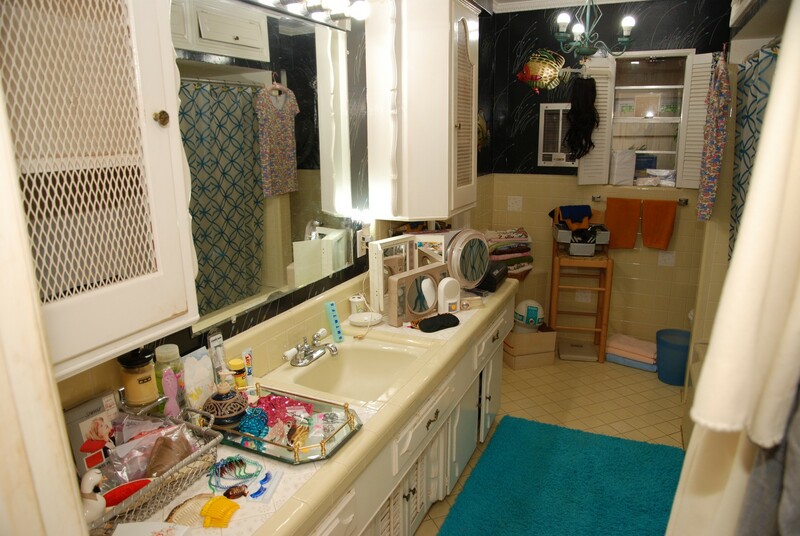 Master Bathroom – features lighted mirrors, hand mirrors, towels, brushes, bottles, hair ornaments, and carrying bags. 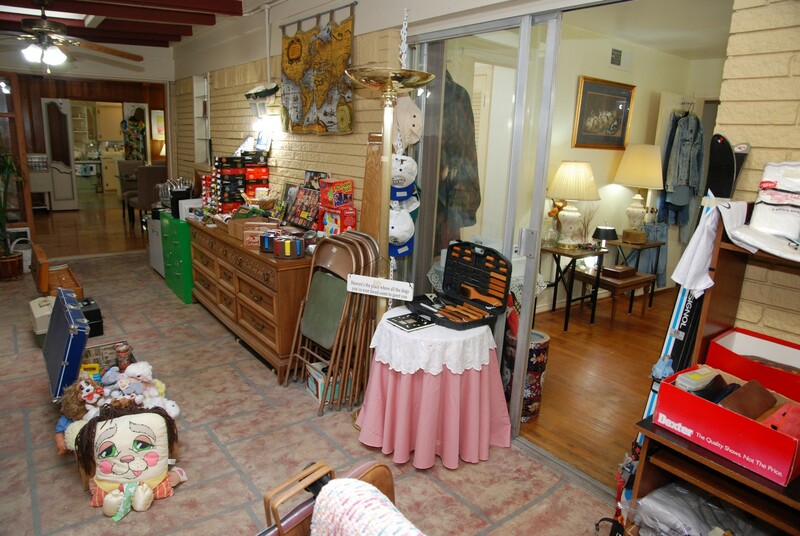 There are vintage items and modern items. 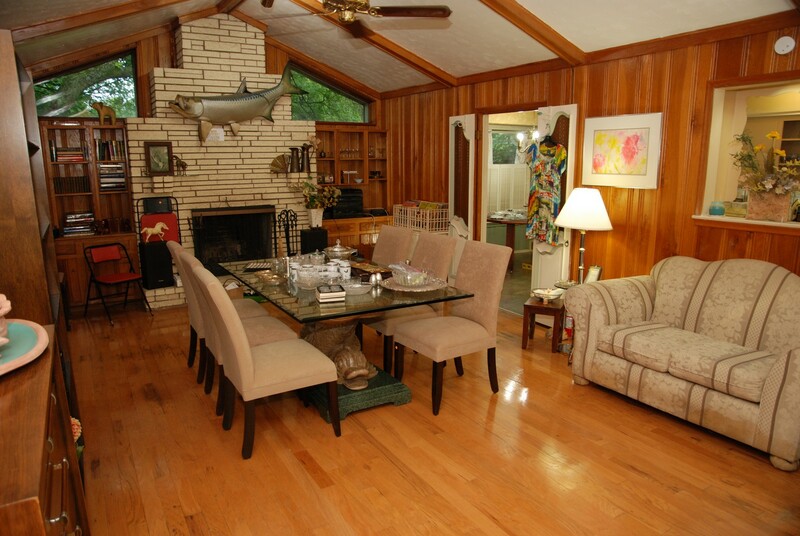 There is a tall bar stool matching the one in the Sun Room. 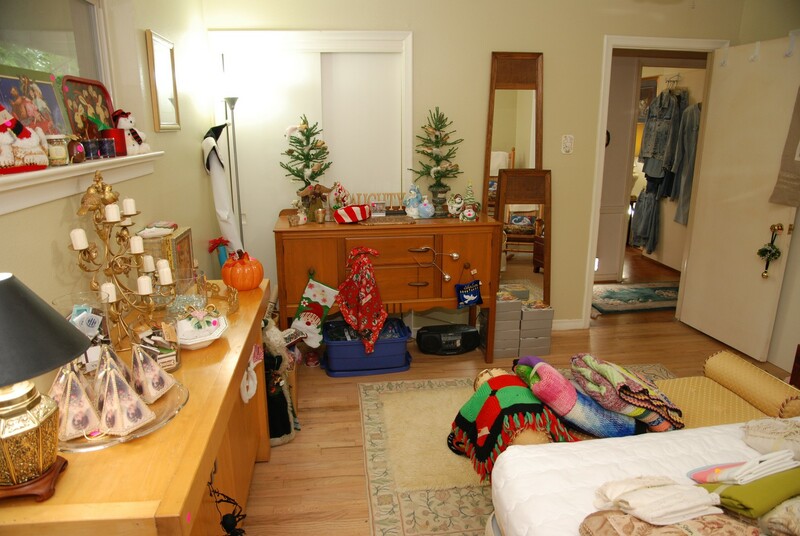 There are hair pieces and wigs, bath robes, and a Home Spa. 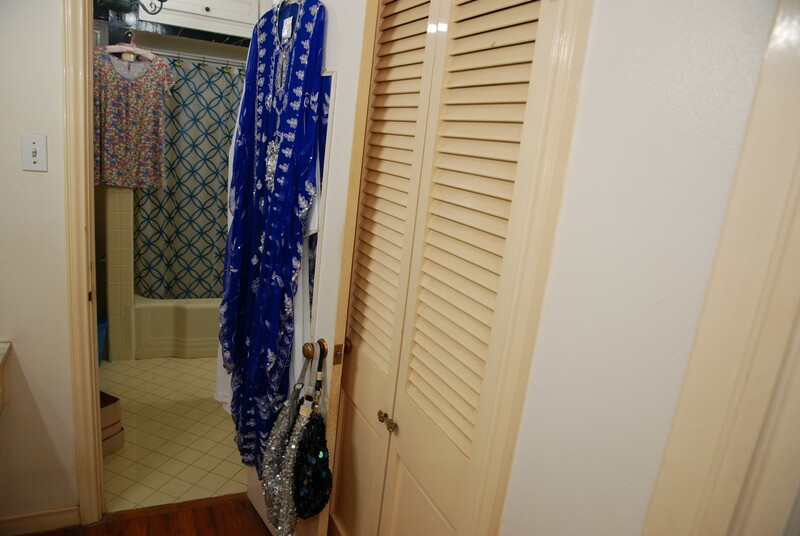 We have a bottle collection and a hair items in the second half of the “L” bath. 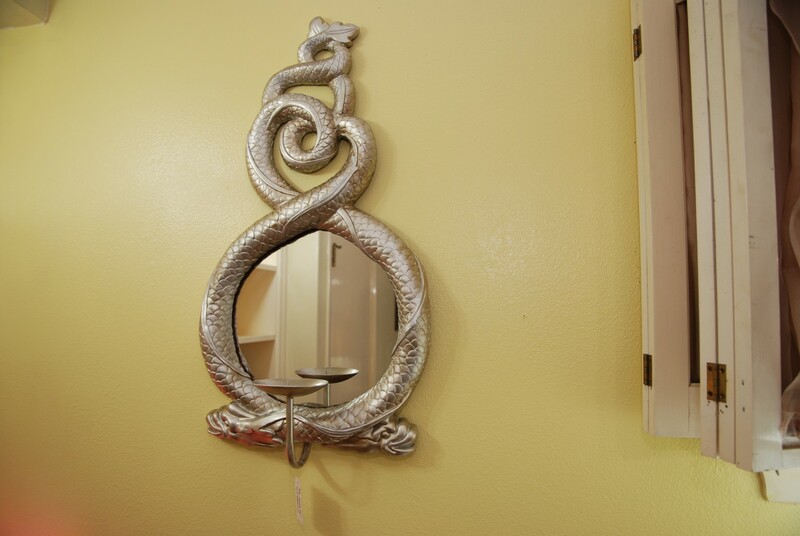 There are curling irons and a small lamp. 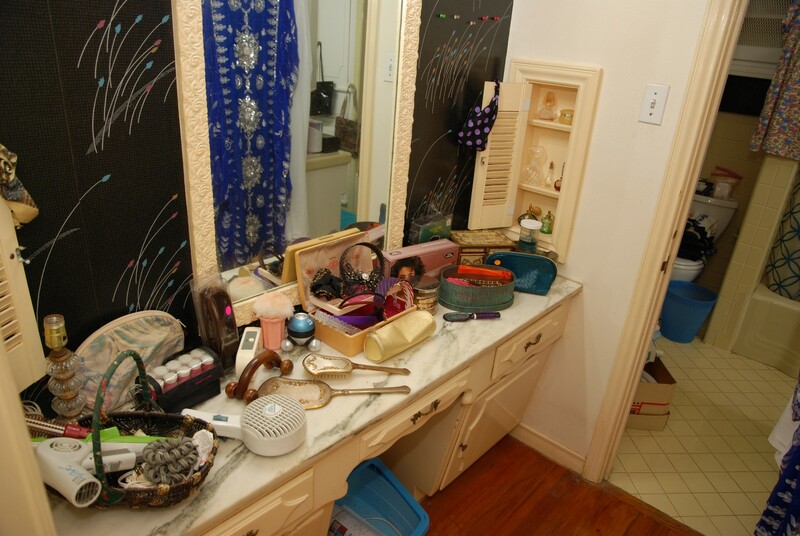 There have hot rollers, a hair dryer, cosmetic bags, and hair adornments. 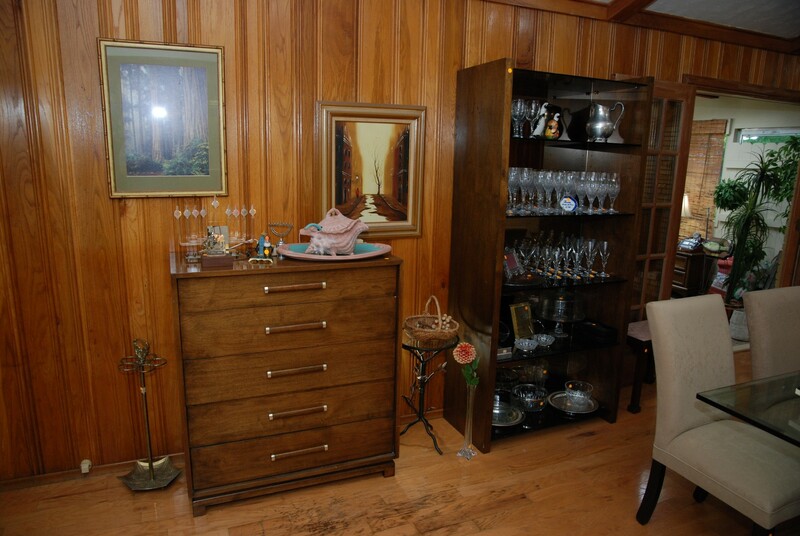 Front Corner Bedroom – features another piece of furniture from Omaha Steaks. 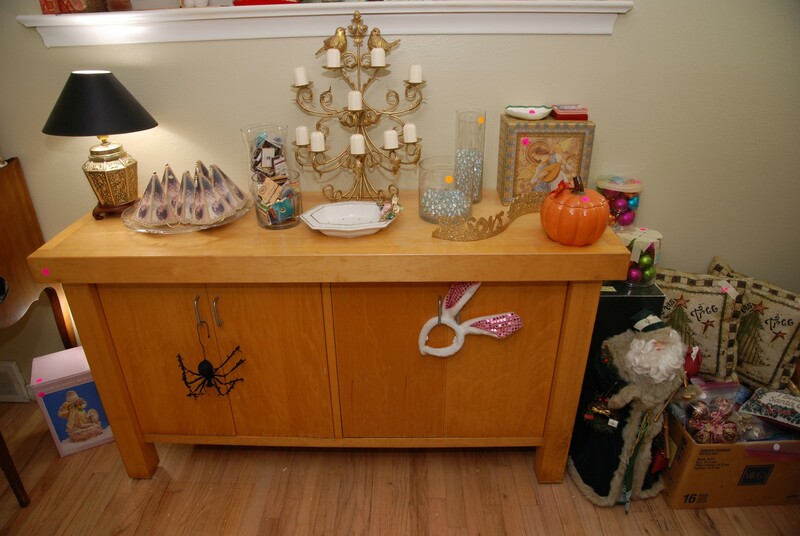 It is a heavy duty counter top storage unit with four doors at the bottom and a nice solid wood top. This piece is heavy. 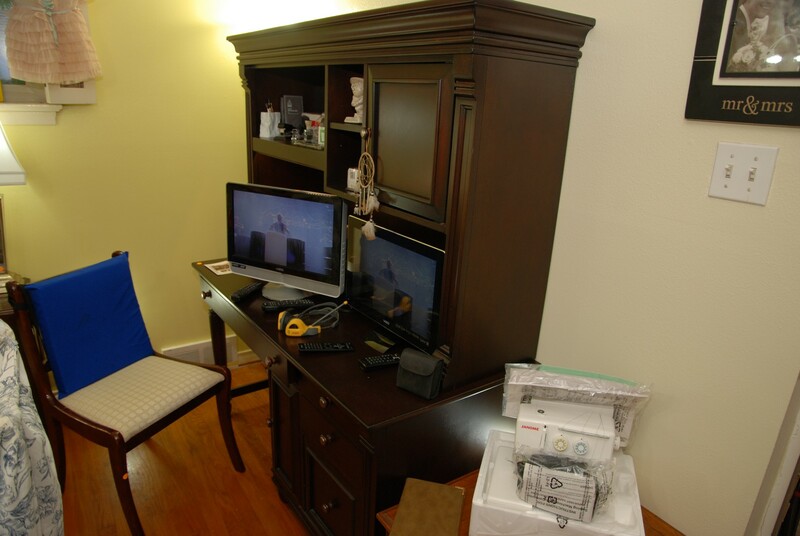 We also have a nice smaller (petit) desk, and a double mattress and box spring with metal frame and rollers. 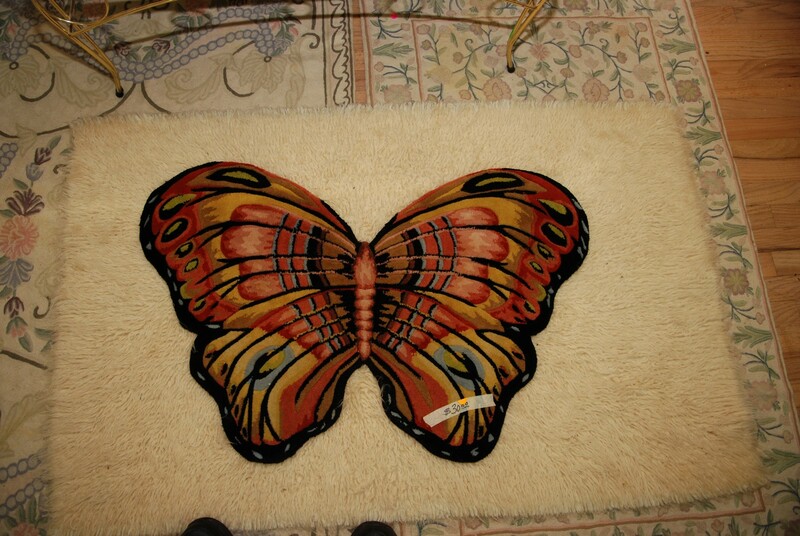 There are two smaller area rugs and a great wool butterfly rug. 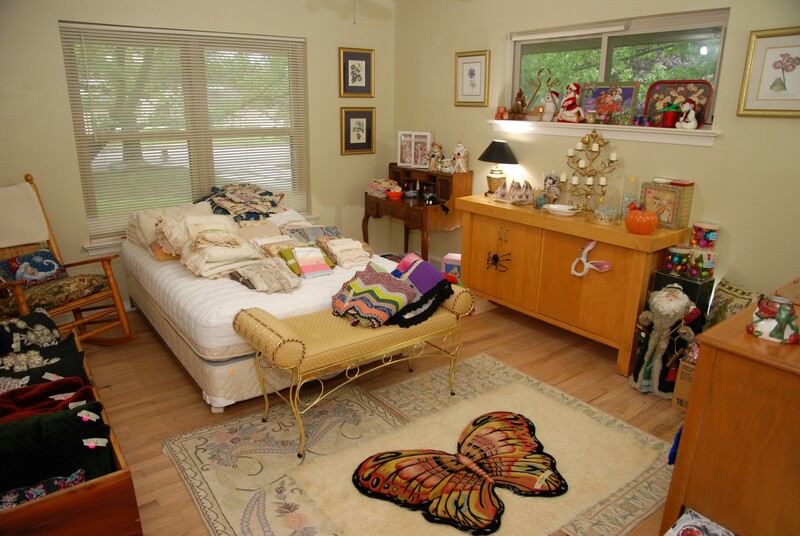 This room also has a great cedar chest full of throw pillows. 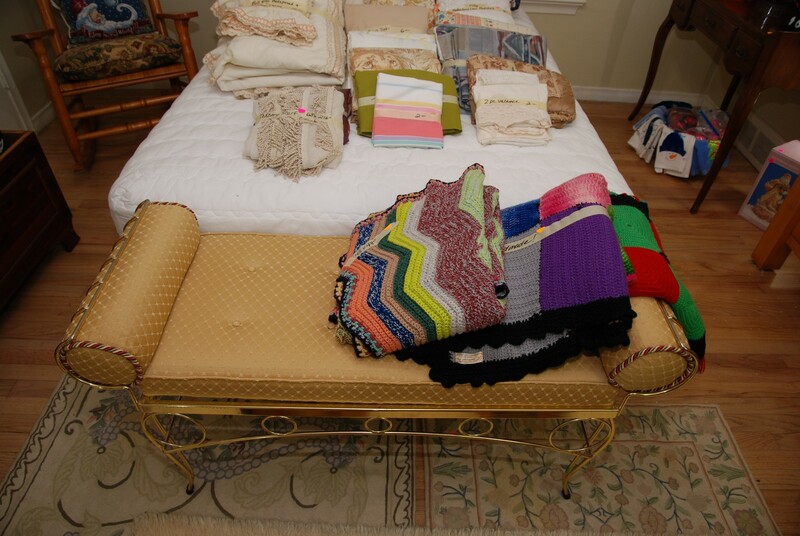 We also have a replica Kennedy Rocker and a nice metal and rolled pillow bench. 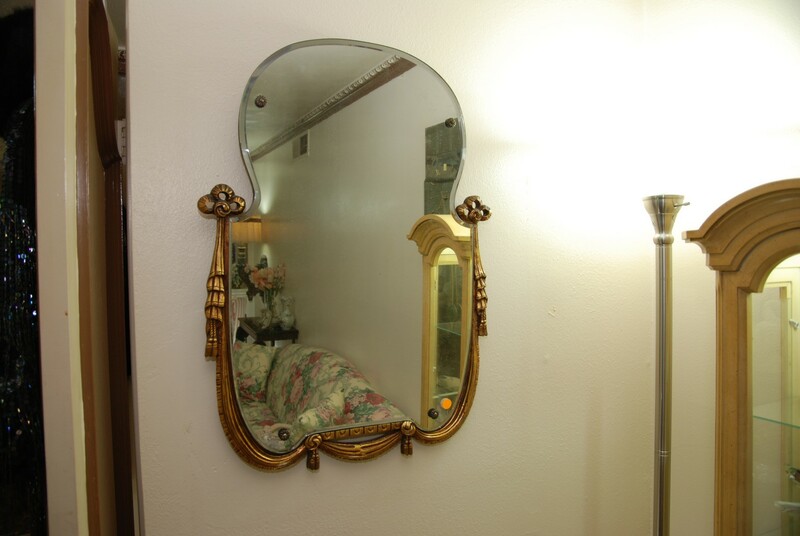 We have two matching mirrors and a double dresser. 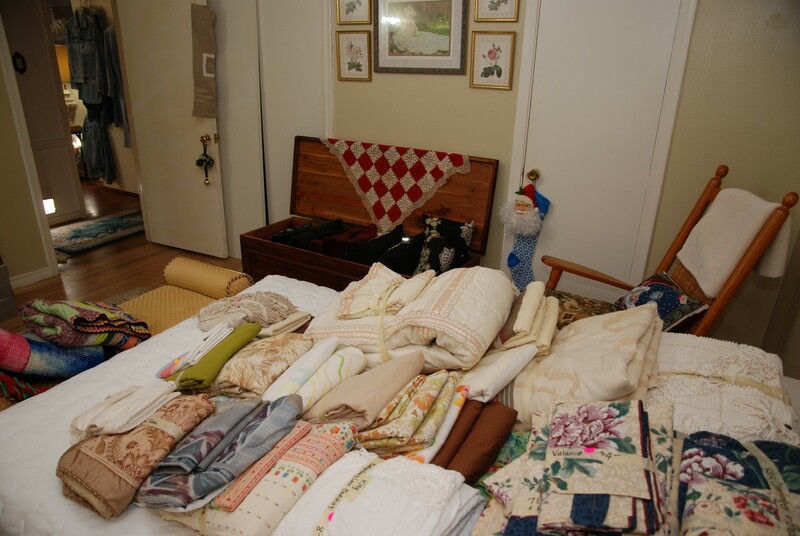 We have an assortment of Christmas items in this room, and we also have some nice bedding. Come early for the best selection. 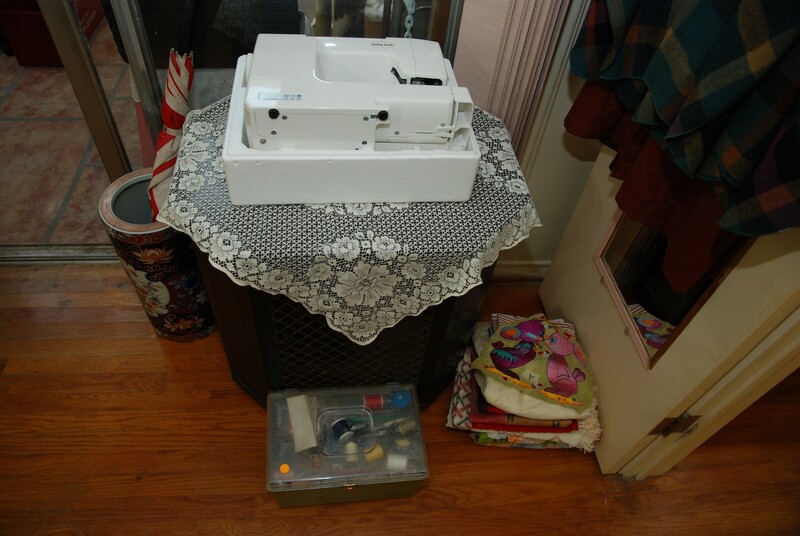 Master Bedroom / Office – features a Janome My Lock Serger and a Baby Lock Sewing Machine. 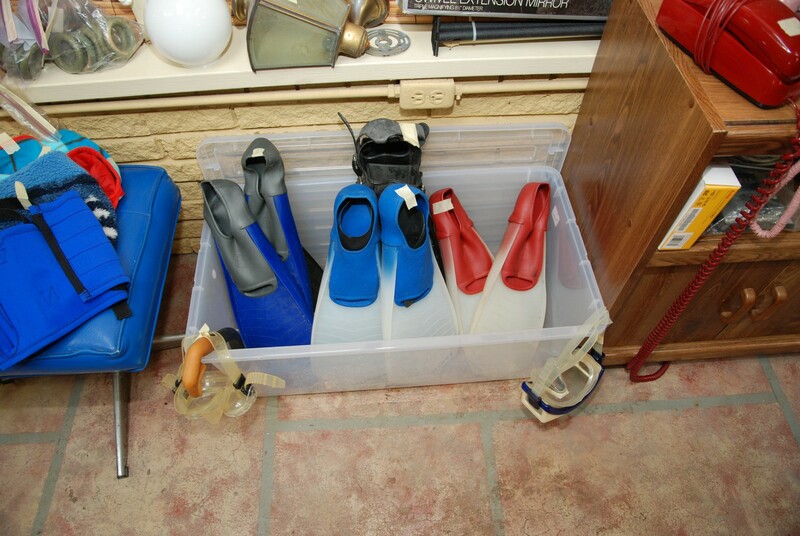 Both are new, and their original boxes are available if you want them. 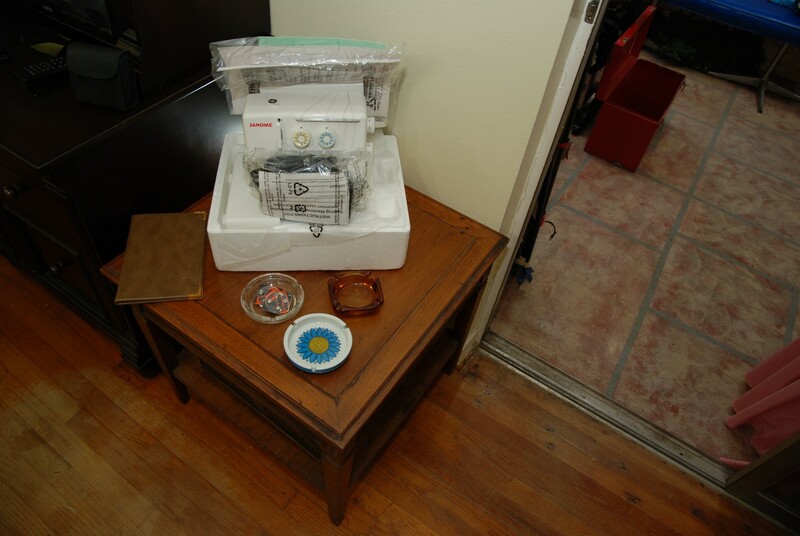 We have a sewing basket and sewing material. 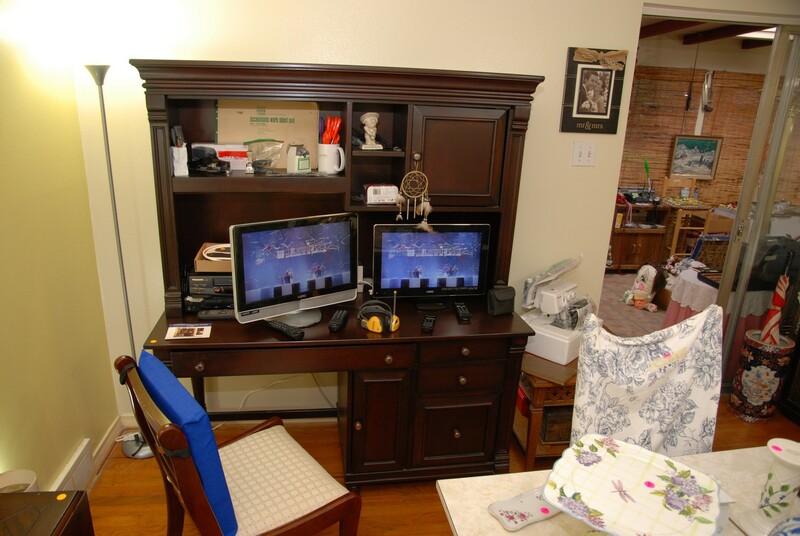 We have a nice two piece (modern) desk with great storage in dark stained wood. There are two Visio TV/monitors w/remotes. 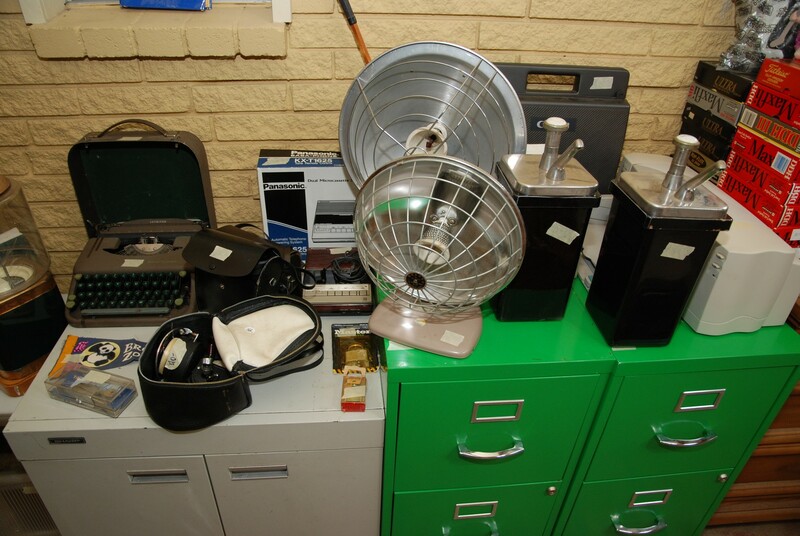 We have small some desk items as well. 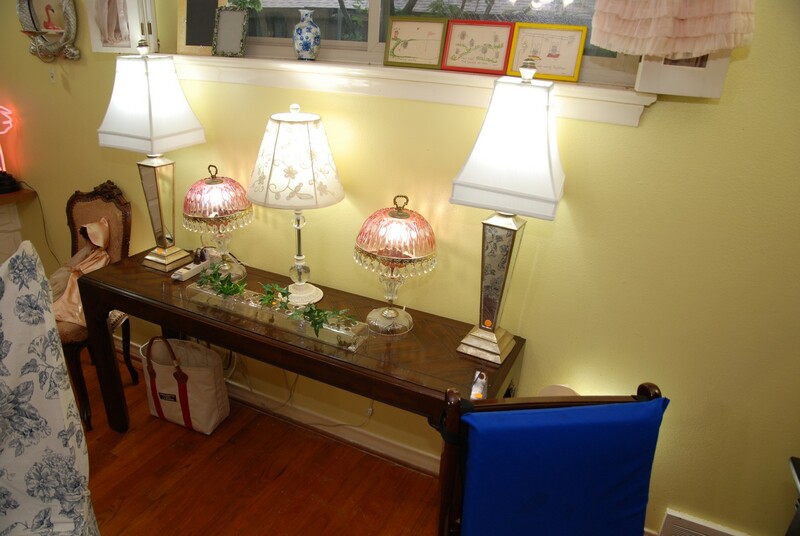 There is a nice sofa table or long entry table with lots of vintage to modern lamps with shades (BNI). 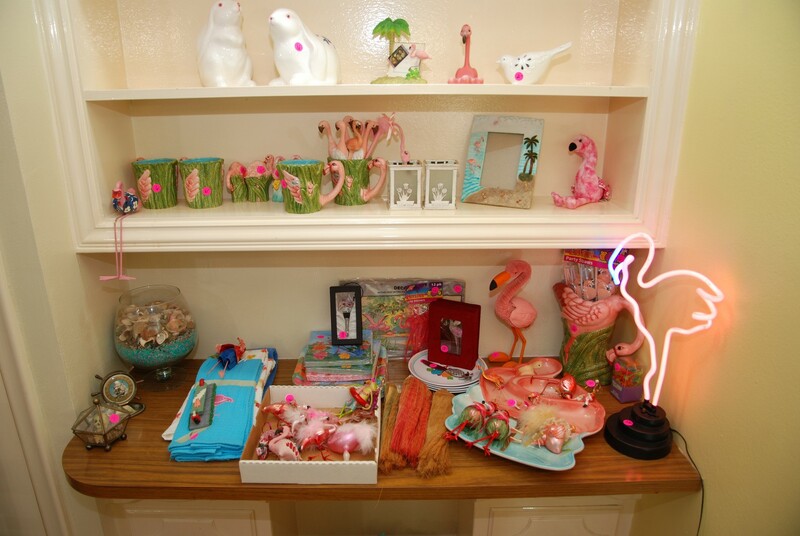 We’ve set up a flamingo area with a neon flamingo light, dishes, cups, ornaments, and little trinkets – really cool. 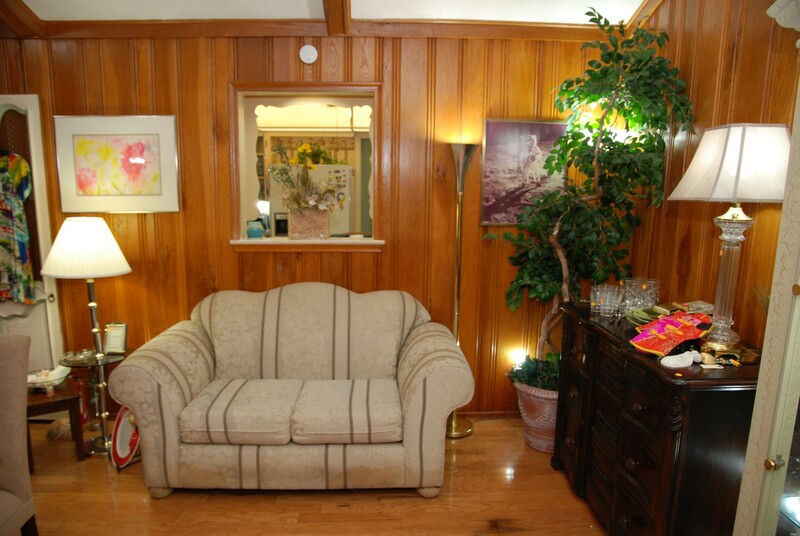 We have some nice wall art and pictures in this room as well. 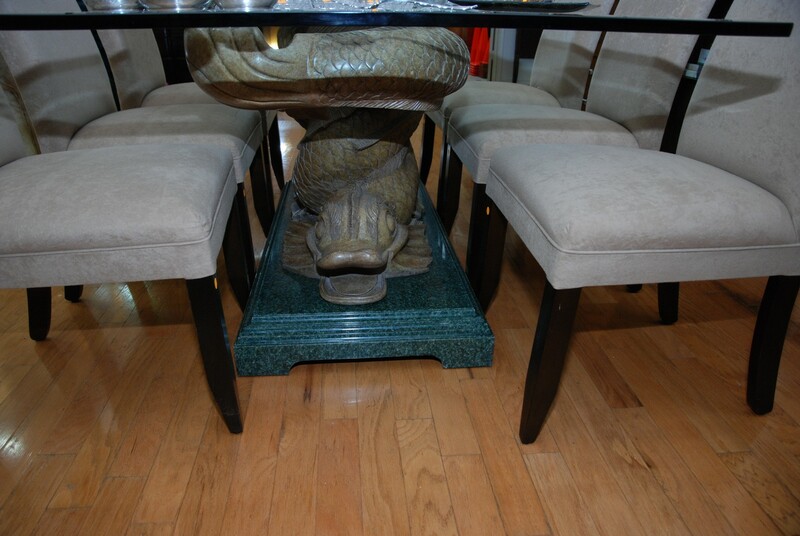 We have a table with unusual legs and a swivel Formica top. 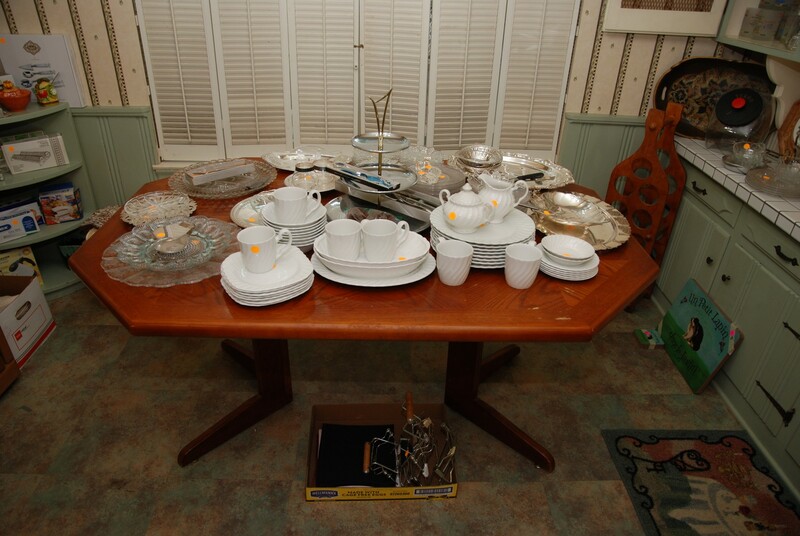 We have lots of modern style dish items on this table, a nice square cake plate, cups, glasses and more. 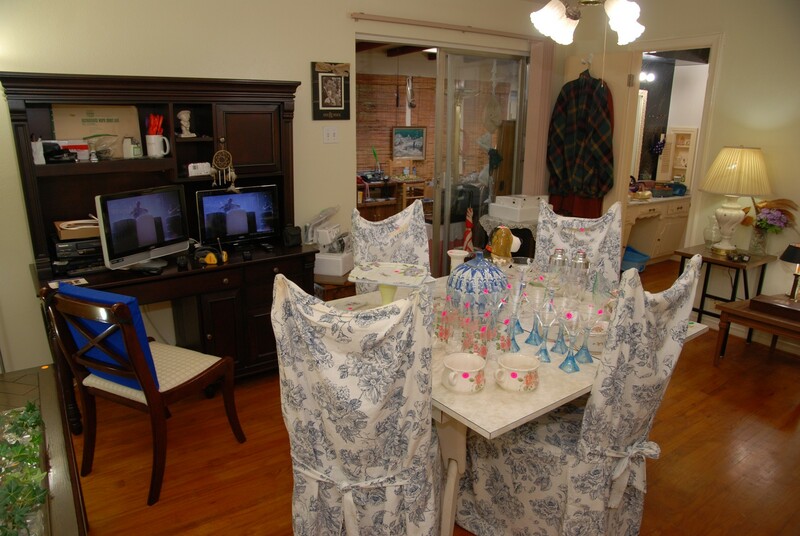 There are four covered vintage chairs. You can replace the chair fabric to suit your taste. 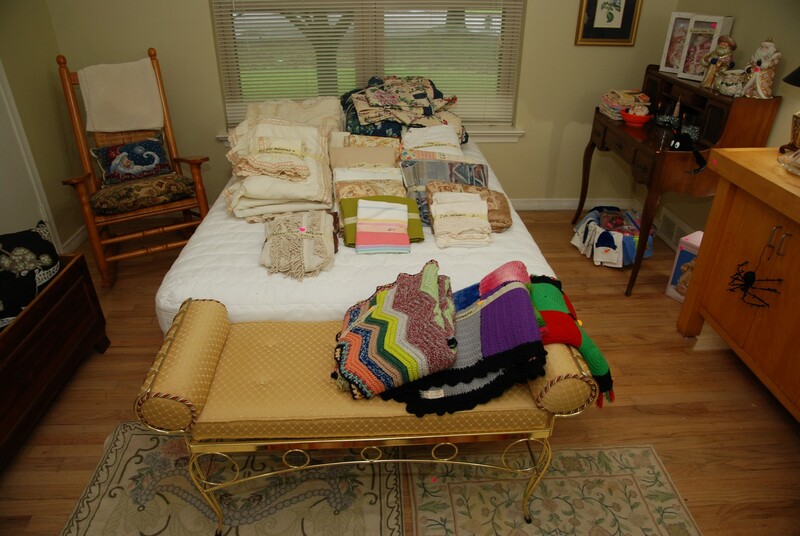 We also have a rack of sweaters, a wedge-shaped table and two small square side tables (all Formica tops). There is a nice stationary office chair and a rattan side chair. 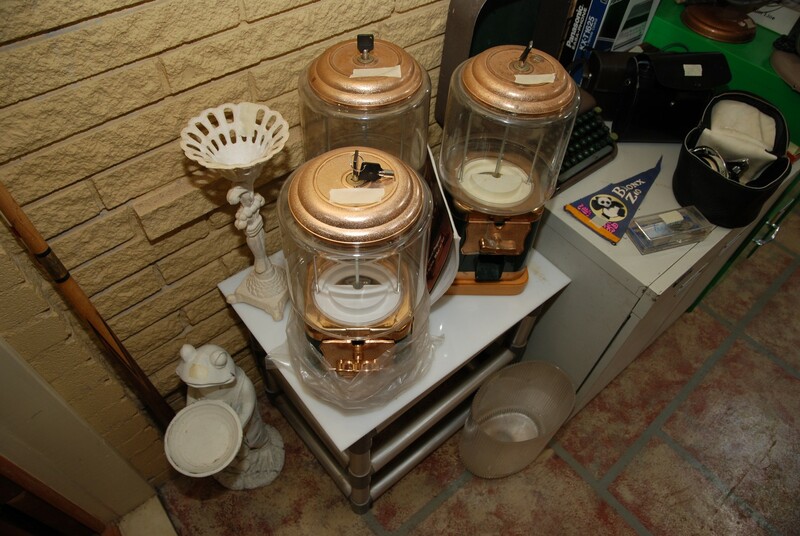 There are lamps with shades on the small tables (BNI). We have interesting denim pieces hanging on the door. Come early for the best selection. 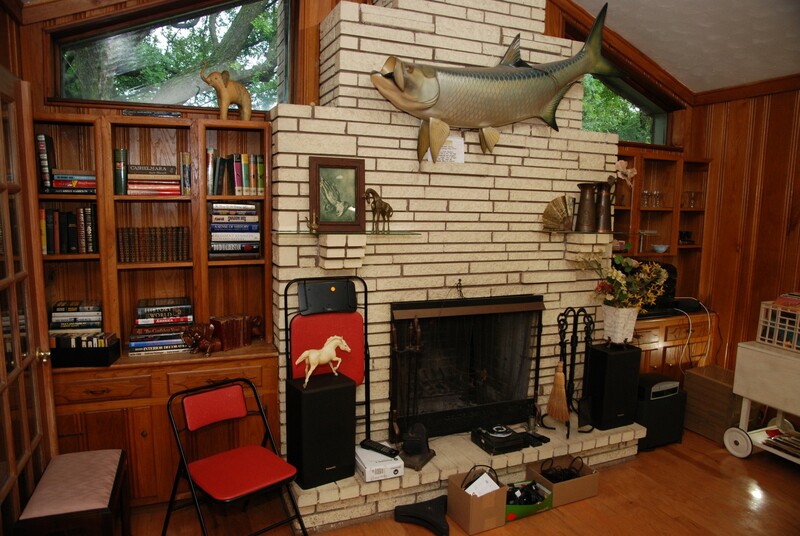 Sun Room / Garage – features skis by Rossignol and some hand weights. 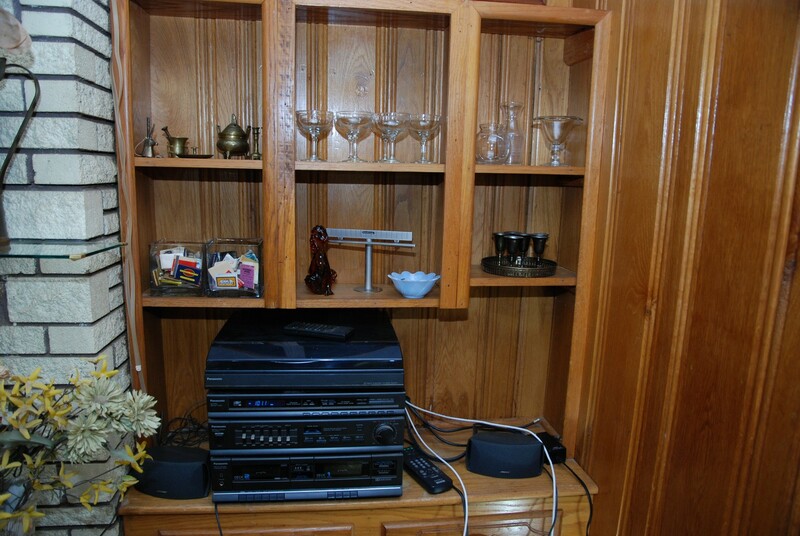 There are framed pictures and assorted knick-knacks on the built-in shelves. We have lamps with and without shades (BNI). 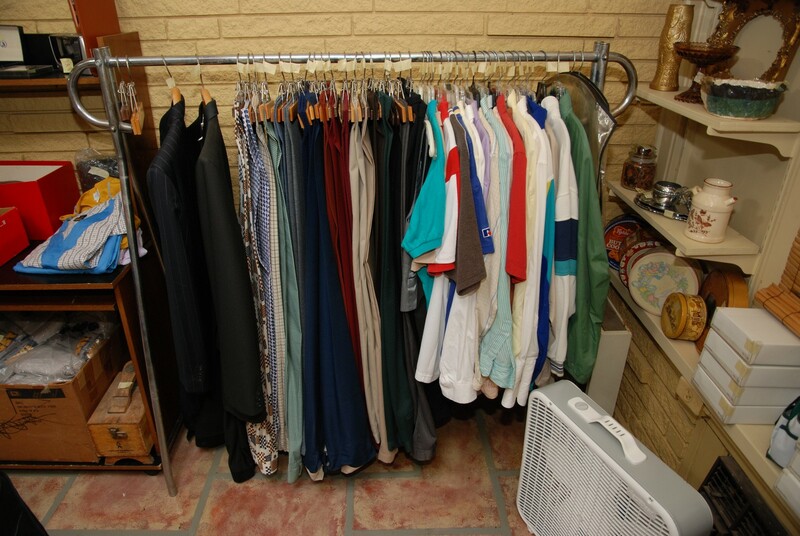 We have small rugs, some Samsonite folding chairs, wall paper, a rack of men’s clothing (suits, shirts, pants, and sportswear). 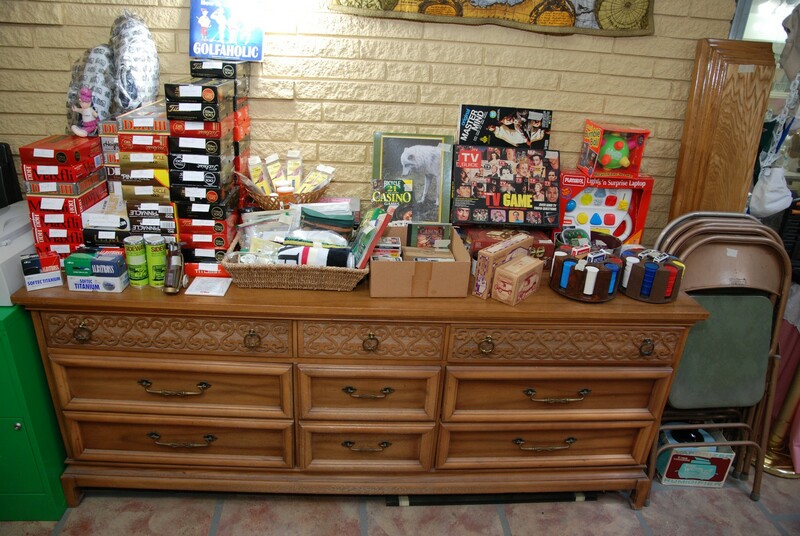 We have lots of neckties and men’s NEW golf shoes along with plenty of golf balls. 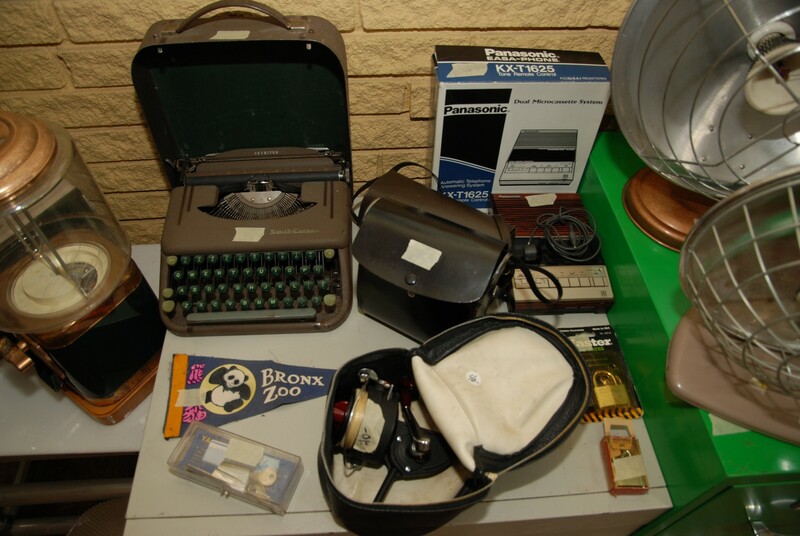 There are vintage radios, cameras, ceiling lights, and electrical items. 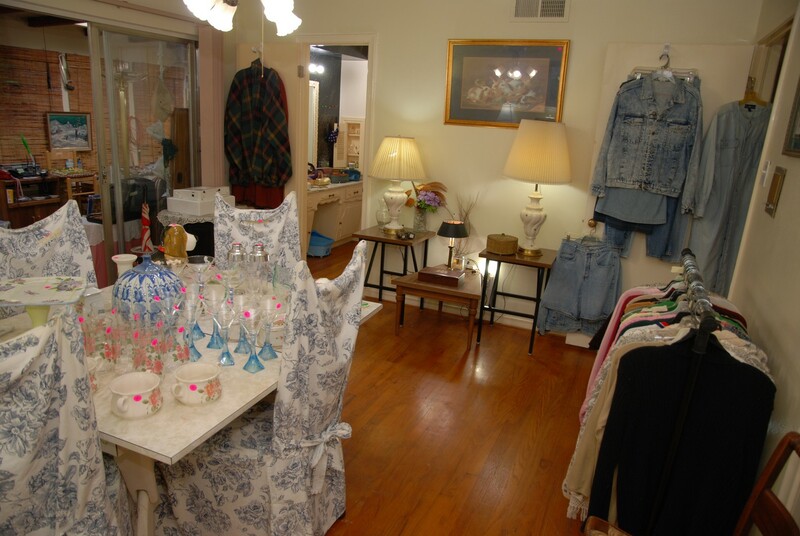 We have tennis rackets and two great vintage blue benches. There are swim fins and a weight bench. There are tool boxes and new shirts. There is a great grilling set with carry case and a round portable table. We have lots of men’s caps and poker chips in a caddy. 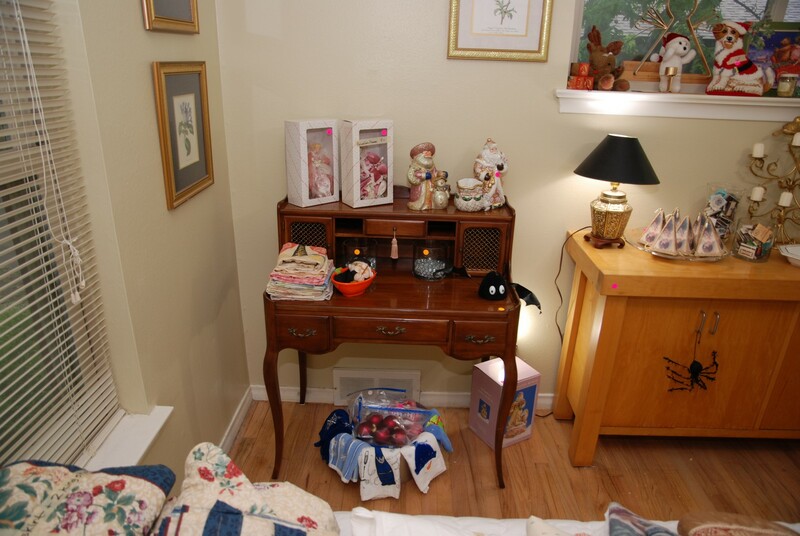 There are playing cards, games and toys along with a vintage triple dresser. 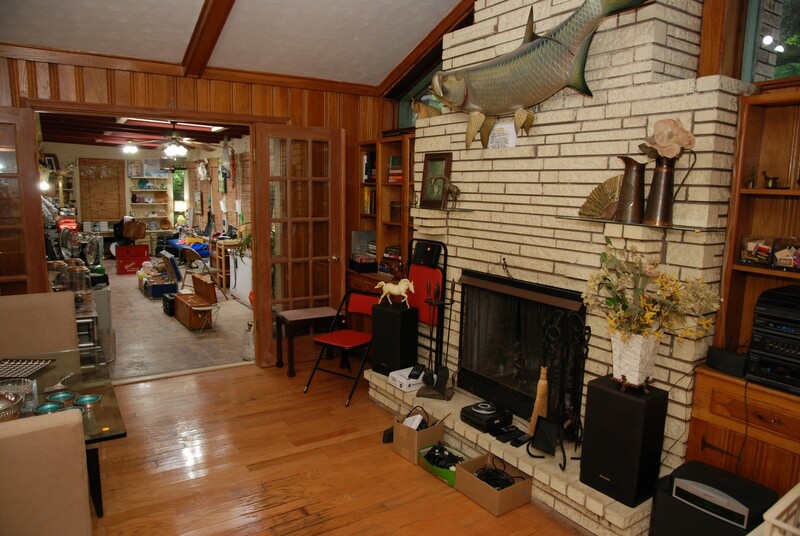 There are stuffed animals, trunks, and a tall bar chair matching the one in the master bath. We have vintage princess phones and walkie-talkies. 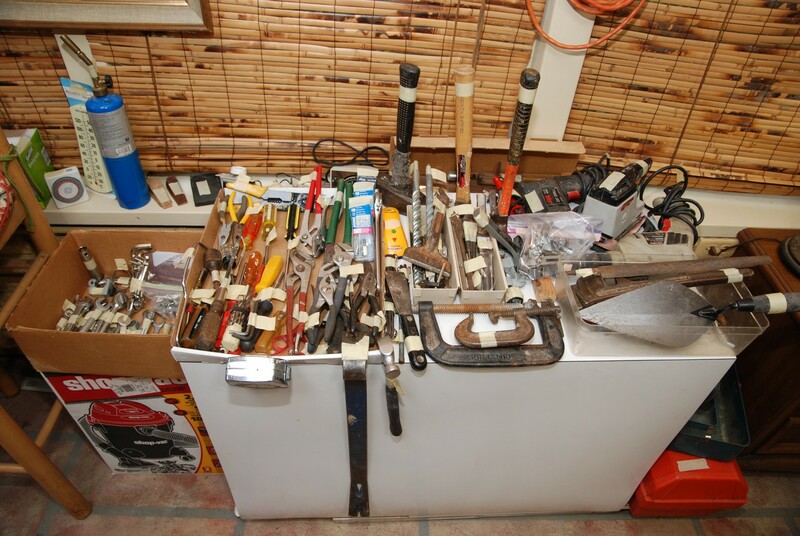 We have hand tools and two two-drawer file cabinets in green. We have another beige file cabinet. 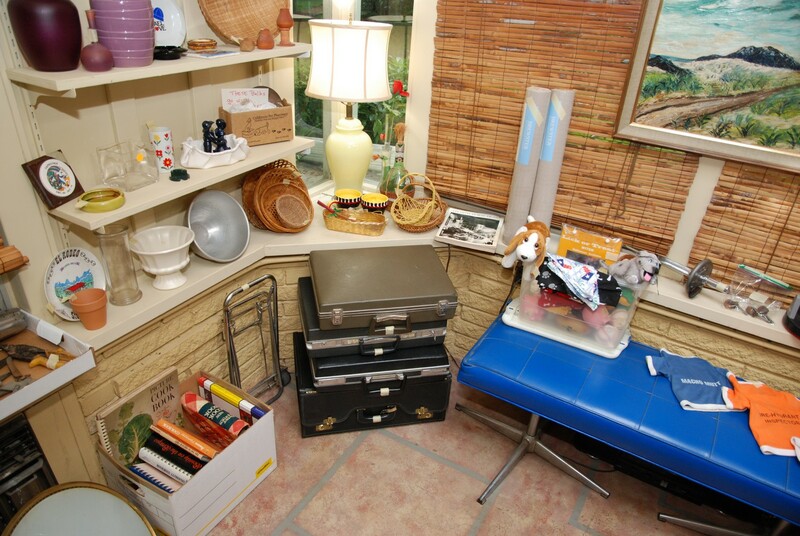 This sunroom is packed with lots of interesting finds. 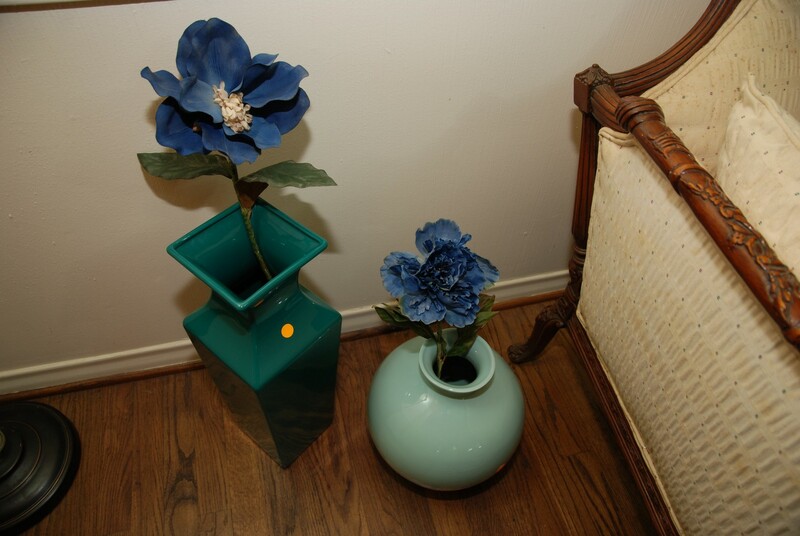 We have a few artificial plants and small trees. 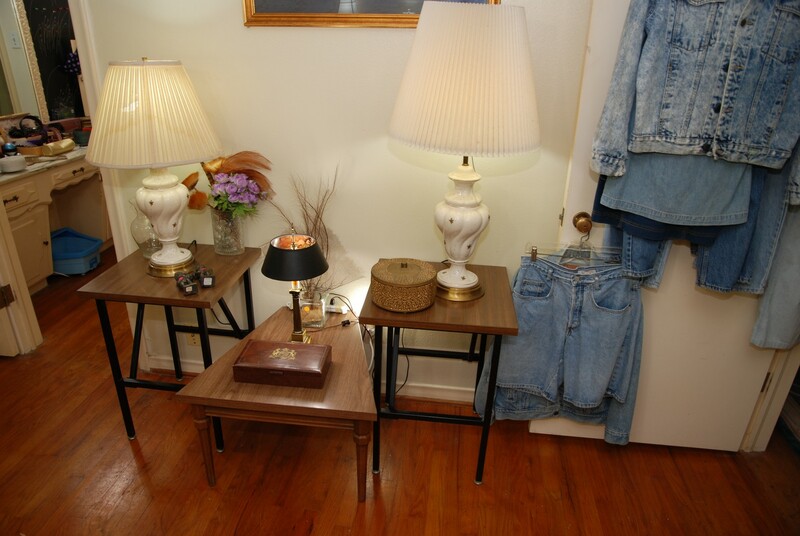 We have a vintage night stand and lamps (BNI). 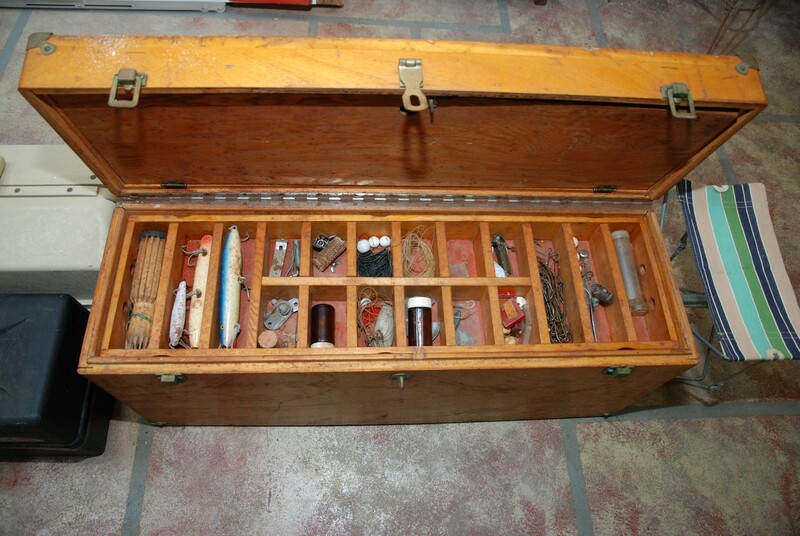 Finally, we have a rare vintage fishing box and vintage fishing lures. 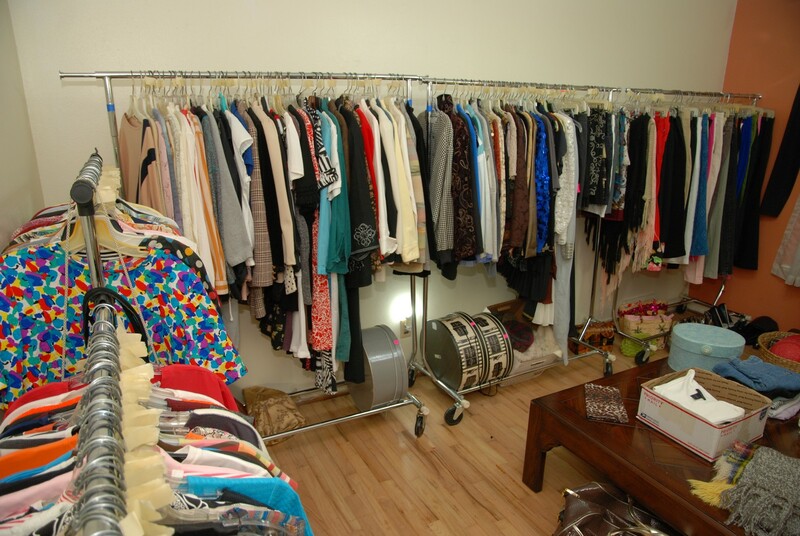 Come early to get the best selection. We look forward to seeing you at this Sale! 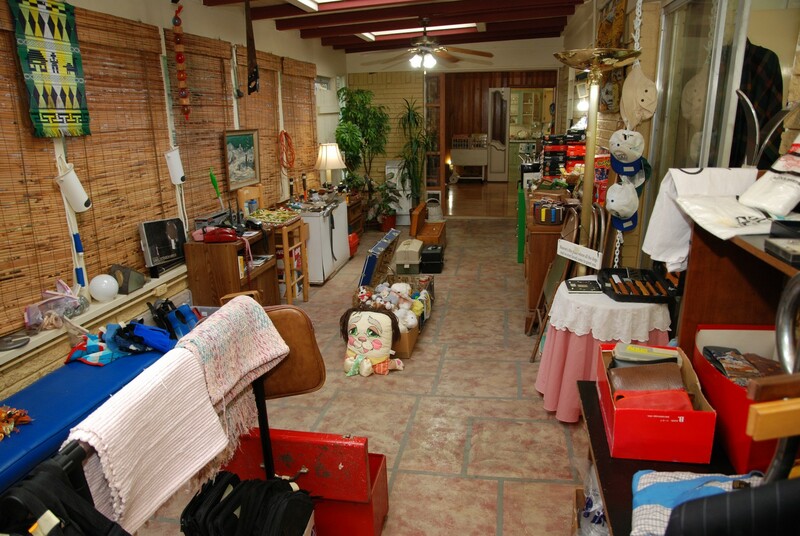 ALL ITEMS ARE SOLD AS IS . . . NO Returns! If you break it, you buy it! - Thank You! 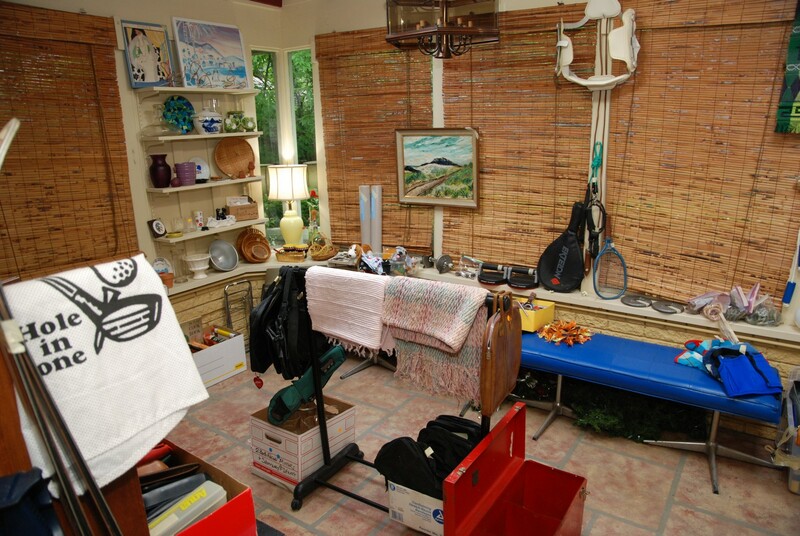 Due to the amount of breakable items and crowded spaces . . .
when we open each morning we will limit the number of people inside. Please do not bring large Bags, Boxes or oversized Purses inside. 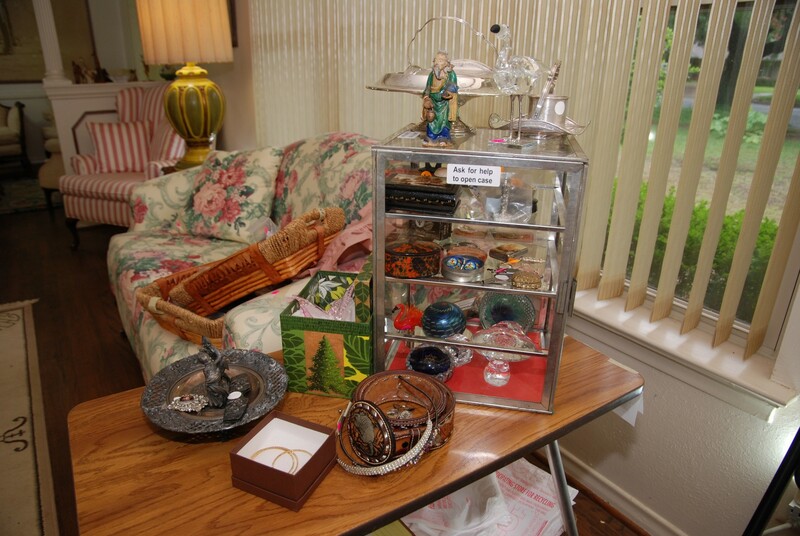 We provide plastic "browsing baskets" for your convenience. Please bring your own help to load your purchased items! Some items must be picked up on Saturday after 12:00 noon. Please – NO unattended children allowed inside the house. Porfavor , No Se permiten niños desatendidos dentro de la casa. We reserve the right to inspect all bags upon exiting. Nos reservamos el derecho a inspeccionar todas las bolsas al salir. 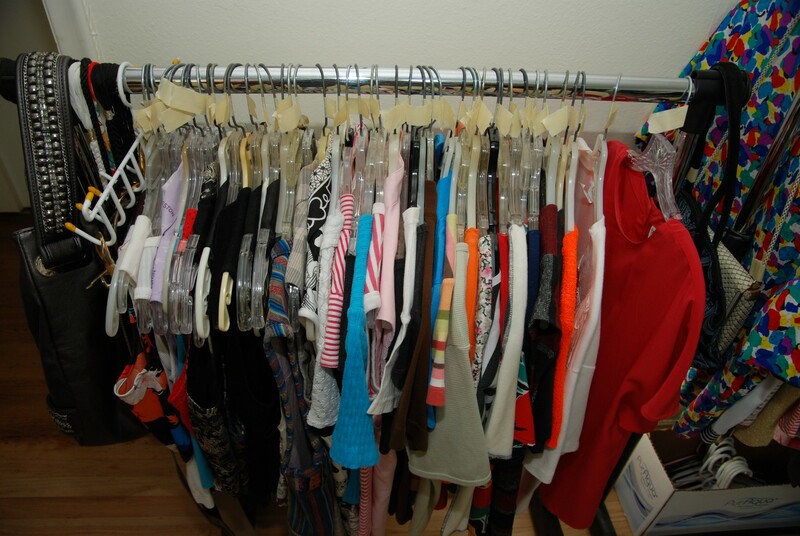 If an item is not priced, bring it to checkout & make a reasonable offer! Tear Tags: Pull tags on larger items, pay for the item and it’s yours! 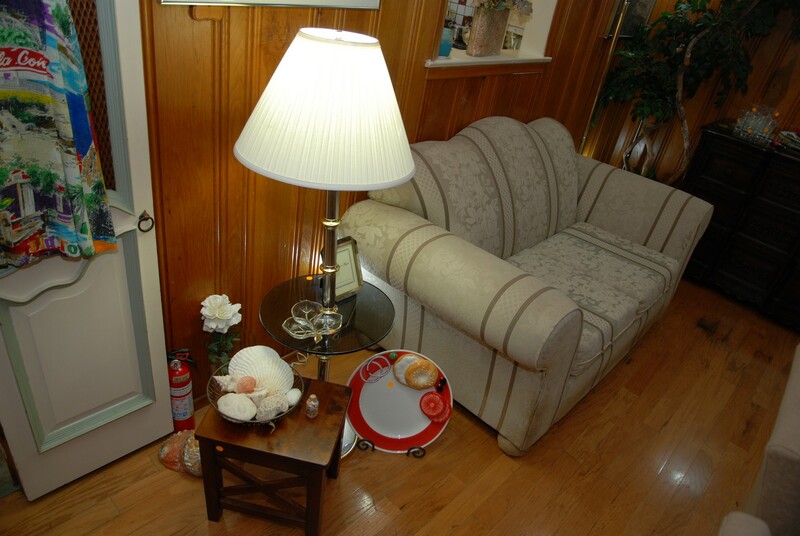 Light Bulbs are Not included with any lamps / fixtures - Thank You! No EARLY BIRDS – Thank You! 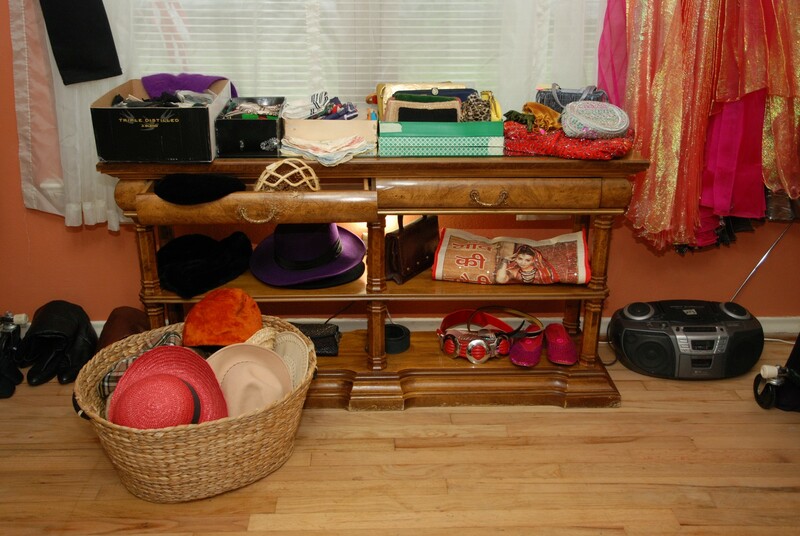 No Holding of Item” – First one with the $$’s (cash) gets the Items . . .
We may limit the number of people inside, so arrive early! We ask you to leave bags, boxes and large purses outside.